Sixteen years ago, the Nomenclature Committee of the International Union of Pharmacology approved a system for naming human seven-transmembrane (7TM) G protein-coupled chemokine receptors, the large family of leukocyte chemoattractant receptors that regulates immune system development and function, in large part by mediating leukocyte trafficking. This was announced in Pharmacological Reviews in a major overview of the first decade of research in this field [Murphy PM, Baggiolini M, Charo IF, Hébert CA, Horuk R, Matsushima K, Miller LH, Oppenheim JJ, and Power CA (2000) Pharmacol Rev 52:145–176]. Since then, several new receptors have been discovered, and major advances have been made for the others in many areas, including structural biology, signal transduction mechanisms, biology, and pharmacology. New and diverse roles have been identified in infection, immunity, inflammation, development, cancer, and other areas. 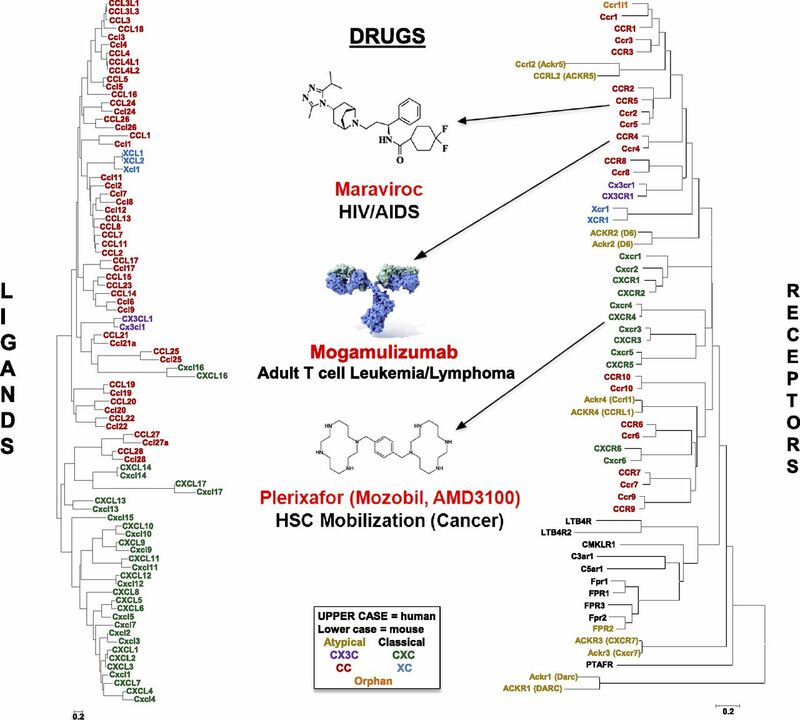 The first two drugs acting at chemokine receptors have been approved by the U.S. Food and Drug Administration (FDA), maraviroc targeting CCR5 in human immunodeficiency virus (HIV)/AIDS, and plerixafor targeting CXCR4 for stem cell mobilization for transplantation in cancer, and other candidates are now undergoing pivotal clinical trials for diverse disease indications. In addition, a subfamily of atypical chemokine receptors has emerged that may signal through arrestins instead of G proteins to act as chemokine scavengers, and many microbial and invertebrate G protein-coupled chemokine receptors and soluble chemokine-binding proteins have been described. 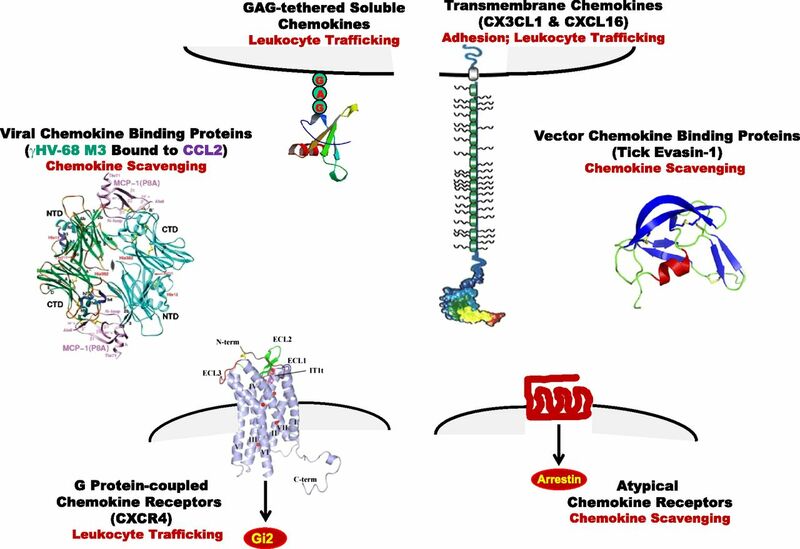 Here, we review this extended family of chemokine receptors and chemokine-binding proteins at the basic, translational, and clinical levels, including an update on drug development. We also introduce a new nomenclature for atypical chemokine receptors with the stem ACKR (atypical chemokine receptor) approved by the Nomenclature Committee of the International Union of Pharmacology and the Human Genome Nomenclature Committee. The chemokine signaling system consists of chemokine ligands and 7TM receptors that coordinate leukocyte trafficking in the vertebrate immune system. First appearing in teleost fish, chemokines constitute the largest family of cytokines, and chemokine receptors constitute the largest branch of the γ subfamily of rhodopsin-like 7TM receptors. 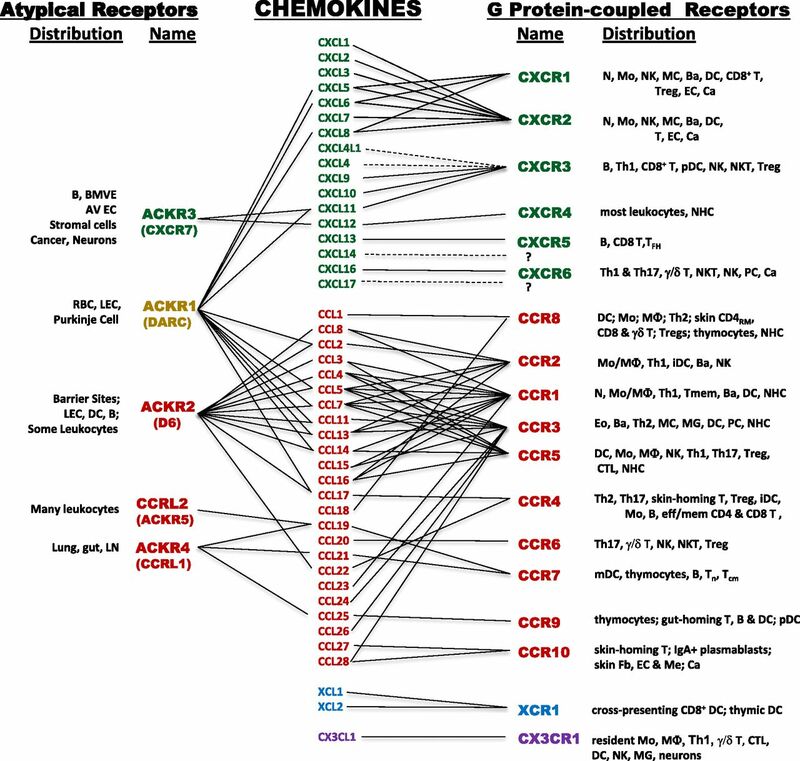 Chemokine receptors are differentially expressed by all leukocytes and many nonhematopoietic cells, including cancer cells, and can be divided into the following two groups: G protein-coupled chemokine receptors, which signal by activating Gi-type G proteins (see section II), and atypical chemokine receptors, which appear to shape chemokine gradients and dampen inflammation by scavenging chemokines in a G protein-independent, arrestin-dependent manner (see section III). A key structural determinant that distinguishes these two groups is the sequence motif DRYLAIV, located at the end of transmembrane domain 3, which is well conserved in most G protein-coupled chemokine receptors, but is poorly conserved in atypical chemokine receptors. G protein-coupled chemokine receptors have been reported to activate a variety of downstream phospholipid-modifying enzymes, including PI3K, phospholipase Cβ2 and β3, phospholipase A2, and phospholipase D; mitogen-activated protein kinases (MAPK); and tyrosine kinases. Further downstream, low molecular weight G proteins such as Rac, Rho, and cdc42 may be activated, which mediate specific aspects of cell migration, including actin polymerization, adhesion, and membrane protrusion. The relative importance of each of these mediators may vary for each receptor and may be context- and cell type-dependent. Vertebrate G protein-coupled chemokine receptors represent the largest group of chemokine receptors, which is subdivided into four subgroups, defined by which of four subgroups of chemokines is bound. Chemokine subgroups are structurally defined and named by the number and arrangement of conserved cysteines (Fig. 1). Vertebrate G protein-coupled chemokine receptors can also be classified loosely into three functional groups as follows: homeostatic, inflammatory, and dual inflammatory/homeostatic subtypes, according to whether they are used for immune system development and basal leukocyte trafficking (homeostatic) or emergency trafficking of leukocytes to sites of infection or tissue injury (inflammatory) or both (inflammatory/homeostatic). Functional chemokines and chemokine receptors are also encoded by herpesviruses and poxviruses, which appear to have obtained them by copying genes from their hosts (see section IV.A). Viral chemokine receptors are 7TM proteins that may signal constitutively and in response to binding host chemokines, often by activating a diverse repertoire of G proteins. Soluble non–7TM chemokine-binding proteins, typically with broad specificity for inflammatory chemokines, have also been found in Herpesviruses and Poxviruses, as well as in tick saliva, and may act as anti-inflammatory immune evasion factors (see sections IV.A and V). Chemokine receptors may function beneficially, for example, in antimicrobial host defense, or harmfully, for example, in the setting of chronic inflammation, autoimmunity, infectious disease, and cancer. Some pathogens, most notably HIV and Plasmodium vivax, exploit host chemokine receptors as key cell entry factors by deploying chemokine mimics. Chemokines may also have nonimmunologic functions, including regulation of organ development. Because inflammation is important in many diseases and because chemokine receptors are GPCRs that mediate inflammatory responses, identifying diseases in which specific chemokine receptors play an important role in susceptibility and/or outcome for targeting with drugs has been a logical and attractive goal ever since the discovery of the chemokine system. To date, however, despite massive effort, only two drugs, maraviroc and plerixafor, targeting chemokine receptors CCR5 and CXCR4, respectively, have been approved by the United States Food and Drug Administration (FDA), neither of which targets inflammation as an indication. This experience, potential explanations for the failure to develop chemokine receptor-targeted medicines in inflammation to this point, and potential ways forward have been discussed recently in several excellent reviews (Schall and Proudfoot, 2011; Pease and Horuk, 2012). In the present article, we provide an update of the basic, translational, and clinical advances made for each chemokine receptor in the past decade. General principles of chemokine structure and function are summarized in Tables 1 and 2 and Figs. 2–6, and specific details for each receptor are described in the individual sections. The first chemokine receptors defined at the molecular level were human CXCR1 and CXCR2 (Holmes et al., 1991; Murphy and Tiffany, 1991), the prototypic neutrophil chemotactic receptors for a group of CXC chemokines distinguished by the presence of the amino acid motif ELR in the N-terminal domain. The corresponding genes are clustered on chromosome 2q35, along with a pseudogene for CXCR2 named CXCR2P1 (IL8RBP). The chromosomal location of this cluster and all other human chemokines and chemokine receptors is summarized in Fig. 3. Expression of CXCR1 and CXCR2 is tightly regulated in neutrophils by external signals such as tumor necrosis factor (TNF)-α, lipopolysaccharide (LPS), Toll-like receptor (TLR) agonists, and nitric oxide (Khandaker et al., 1999; Alves-Filho et al., 2009). CXCL8 [known previously as interleukin (IL)-8] binds with high affinity to and potently activates both receptors. CXCR1 also binds CXCL6 (granulocyte chemotactic protein-2) and possibly CXCL7 (neutrophil-activating protein-2), whereas CXCR2 binds promiscuously to all seven ELR+ CXC chemokines (Murphy et al., 2000; Stillie et al., 2009). The specificity of these and all other chemokine receptors for ligands and leukocytes is summarized in Fig. 6. The ELR motif partly determines receptor specificity (Clark-Lewis et al., 1993), and other modifications of the N′-terminal region [e.g., CXCL8(3–73)K11R)] may increase receptor affinity (Li and Gordon, 2001). Post-translational citrullination was reported to control the activities of CXCL5 and CXCL8 (Proost et al., 2008). Both monomers and dimers of CXCL8 induce neutrophil migration in vivo, but distinct equilibria exist between them in different tissues possibly as a result of regulation by glycosaminoglycan (GAG) binding (Tanino et al., 2010; Gangavarapu et al., 2012). GAG binding maps in CXCL8 to the C′-terminal helix of the chemokine and to the proximal loop around residues 18–23 (Kuschert et al., 1998). Several studies have been published identifying nonchemokine ligands for CXCR1 and/or CXCR2, although the actual significance of this is not known. Some of these, including the collagen breakdown product N-acetyl-proline-glycine-proline, macrophage migration inhibitory factor, the N′-terminal domain of human tyrosyl-tRNA synthetase, Brugia malayi asparaginyl-tRNA synthetase, and the HIV matrix protein p17, were suggested to have sequence/charge/structure similarities to ELR+ CXC chemokines, whereas LL-37, an α-helical peptide derived by cleavage of cathelicidin, does not (Bernhagen et al., 2007; Giagulli et al., 2012). The viral chemokine vCXCL1 of human cytomegalovirus (CMV) binds to both CXCR1 and CXCR2 (Luttichau, 2010) but activates neutrophils, mainly through CXCR2 (Penfold et al., 1999). Whether the neutrophil migration-inducing activity of N-acetyl-proline-glycine-proline and its role in chronic lung inflammation are mediated directly by CXCR1 and CXCR2 or indirectly is currently unsettled (Snelgrove, 2011). ELR+ CXC chemokines are categorized as inflammatory because they recruit neutrophils from blood to sites of infection and inflammation, but they may also have a homeostatic role in regulating neutrophil egress from bone marrow to blood (Kohler et al., 2011) (Fig. 7). ELR+ CXC chemokines also bind to the atypical chemokine receptor ACKR1 (also known as the Duffy antigen receptor for chemokines or DARC) and the virally encoded chemokine receptors Kaposi’s sarcoma-associated herpesvirus-GPCR encoded by ORF 74 of human herpesvirus 8 (HHV8) and ECRF3 of Herpesvirus saimiri (Rosenkilde et al., 1999) (see below). Many members of the CXCR1/CXCR2-ELR+ CXC chemokine axis have been identified in other species (Stillie et al., 2009); however, a murine ortholog of CXCL8 does not exist (Fig. 4) (Zlotnik et al., 2006). The best characterized mouse ELR+ CXC chemokines are KC and macrophage inflammatory protein-2 or MIP-2 (now named Cxcl1 and Cxcl2, respectively), which bind to mouse Cxcr2. Cxcr1 has been reported to respond to mouse Cxcl5 (LIX, a mouse counterpart of human CXCL6) (Fan et al., 2007; Stillie et al., 2009) (Fig. 4); however, native Cxcr1 on mouse leukocytes has not been characterized yet. A Cxcr1 knockout mouse has been generated, but its distinct phenotype is unclear (Clarke et al., 2011; Sakai et al., 2011). A two-step model of ligand binding and receptor activation has been proposed for CXCR4 (see below) that may generally be relevant for other chemokine receptors, including CXCR1 and 2. In particular, the strong interaction of CXCL8 with the N′-terminal domain of CXCR1 may lead to dissociation of this receptor domain from the membrane with which it interacted, followed by transition of the chemokine to a second binding site composed of the extracellular loops and transmembrane residues (Joseph et al., 2010; Park et al., 2011, 2012). This step then induces a conformational change on the receptor, allowing subsequent activation of heterotrimeric G proteins. Homodimerization of CXCR1 and CXCR2 and heterodimerization with other receptors (for CXCR2) have been demonstrated in transfected cells and may regulate the activation properties of the different partners (Martinez Munoz et al., 2009; Stillie et al., 2009). CXCR1 is the first GPCR whose unmodified structure has been solved in the absence of ligand or antibody and the first to be solved by NMR spectroscopy (Park et al., 2012). Several significant differences were observed relative to the crystal structure of CXCR4 (see below), including a monomeric structure, the presence of a C-terminal α-helix, and shifts of the transmembrane domains. After ligand binding to CXCR1 and CXCR2 in neutrophils, the receptors primarily activate Gi proteins (Damaj et al., 1996). Gαi2 coupling determinants on the receptors include intracellular loop 2 (ICL2) and ICL3; the C′-terminal domain regulates receptor activation and desensitization (Sai et al., 2006). G protein βγ subunits appear to be required for CXCL8-mediated phagocyte migration (Neptune et al., 1999). Many downstream mediators are induced after CXCR1 and CXCR2 activation [e.g., PLC, phospholipase D (PLD), MAPK and signal transducer and activator of transcription 3 (STAT3)], with key roles identified for PI3Kγ (Waugh and Wilson, 2008; Stillie et al., 2009). However, agonist-specific signaling has been described. For instance, although CXCL1 (GROα), CXCL7, and CXCL8 all induce Ca2+ mobilization in neutrophils, CXCL8 is the most potent chemotactic factor and the only activator of PLD (L'Heureux et al., 1995). Both receptors activate Ca2+ flux and neutrophil exocytosis; however, respiratory burst and PLD activation has been reported to depend exclusively on CXCR1 (Jones et al., 1996). CXCR2 may mediate migration far from the inflammatory focus where CXCL8 concentrations may be at low levels (Chuntharapai and Kim, 1995; McDonald et al., 2010). Murine models have shown that ELR+ CXC chemokines induce selectin-dependent neutrophil rolling on activated endothelium, followed by integrin-mediated firm adhesion and transendothelial migration to inflamed sites (Huber et al., 1991; Zhang et al., 2001a). CXCL8 also triggers firm adhesion of monocytes to vascular endothelium under shear flow (Gerszten et al., 1999). CXCR1- and CXCR2-dependent migration requires activation of many proteins that may form a “chemosynapse” with the receptors (Raman et al., 2009), including Rho, cdc-42, focal adhesion kinase, paxillin, proline-rich tyrosine kinase 2, PAK1, and Rac2, as well as vasodilator-stimulated phosphoprotein, LASP-1, and IQGAP1. Cytoskeletal elements differentially regulate CXCR1- and CXCR2-induced focal adhesion kinase activation and migration (Cohen-Hillel et al., 2006). Agonists at high concentrations induce phosphorylation of CXCR1 and CXCR2, leading to homologous desensitization, receptor internalization, and partial degradation. Such processes are regulated by the C′-terminal PDZ ligand binding motif of the receptor, by C′-terminal phosphorylation, and by the LLKIL motif in the C′ terminus (Baugher and Richmond, 2008). Receptor dephosphorylation fosters recycling back to the plasma membrane after ligand removal. Many proteins that mediate these processes have been identified, including arrestins, G protein-coupled receptor kinases, clathrin, dynamin, AP-2, Hip, Rab proteins, and actin filaments. CXCR1 and CXCR2 cross-regulate each other’s downregulation in a process mediated by positive and negative elements in their C′-terminal domains (Attal et al., 2008). CXCR1 and CXCR2 have also been shown to undergo and induce cross or heterologous desensitization, sometimes differentially, with other GPCRs and their ligands, C5a, fMLF, PAF, and other chemokines (e.g., CCR1 and CCR5 agonists) (Nasser et al., 2005); by opiates; and by a 120-kDa fibronectin fragment. CXCR2 may also cross-talk with nucleotide receptors (Werry et al., 2003). The precise physiologic relevance of desensitization and receptor internalization is unclear. Several studies have suggested that CXCR2 internalization is required for receptor recycling and resensitization. Others have claimed that receptor endocytosis terminates the migration of cells when they reach sites of inflammation. β-Arrestin-2 has been reported to induce and strengthen integrin-mediated leukocyte adhesion during CXCL2-CXCR2-driven extravasation in one study (Molteni et al., 2009) but to be a negative regulator of migration to CXCL1 in another (Su et al., 2005). In other studies, high blood levels of murine Cxcl1 cause Cxcr2 desensitization and arrest of neutrophil migration (Wiekowski et al., 2001). Moreover, cross-desensitization of CXCR2 by formyl peptide receptor signaling has been reported to attenuate neutrophil migration into inflamed airways (Sogawa et al., 2011). In addition to neutrophils, CXCR1 and CXCR2 are both expressed by CD14+ monocytes, CD56dim CD16+ natural killer (NK) cells, mast cells, basophils, dendritic cells, and freshly isolated T cells (Robertson, 2002; Geissmann et al., 2003). On T cells, CXCR1 is detected mainly on effector CD8+ cells (Takata et al., 2004), and CXCR1 but not CXCR2 is functional on CD4+Foxp3+ regulatory T cells (Tregs). Many types of nonhematopoietic cells also express one or both receptors (endothelial cells, epithelial cells, neurons, mesenchymal stem cells). As a result, the ELR+ CXC chemokine system has been implicated in diverse pathologies, including infectious diseases, cardiovascular disease (Aukrust et al., 2008; Zernecke et al., 2008), cancer (see references below), central nervous system pathologies, and pain regulation (Rittner et al., 2008), as well as morphogenesis (Ueland et al., 2004). Gene targeting in mice has revealed that Cxcr2 negatively regulates expansion and development of B cells and myeloid progenitors and mediates neutrophil-mediated inflammatory responses to both bacteria and parasites as well as during wound healing (Cacalano et al., 1994; Frendeus et al., 2000). In addition, Cxcr2-mediated neutrophil migration promotes septic injury, autoantibody- and Lyme-mediated arthritis, lung inflammation, and dextran sodium sulfate (DSS)-induced colitis (Buanne et al., 2007). In contrast, Cxcl1−/− mice were more susceptible to DSS colitis (Shea-Donohue et al., 2008). In mouse, neutralization of Cxcr2 attenuates neutrophil-mediated host defense in a model of ascending urinary tract infection with Escherichia coli (Olszyna et al., 2001). Both CXCR1 and CXCR2 are reduced on neutrophils from patients with hyper-immunoglobulin E syndrome, who are susceptible to bacterial infections. CXCR2 may also mediate protection against pulmonary infection by Nocardia asteroides and Aspergillus. ELR+ CXC chemokines have also been implicated in accumulation of neutrophils, CD4+ T cells, and monocytes at sites of allergic inflammation and pulmonary diseases such as chronic obstructive pulmonary disease (COPD), asthma, and cystic fibrosis (Mukaida, 2003; Francis et al., 2004; Traves et al., 2004; Bizzarri et al., 2006). In neuropathology, the CXCR2/CXCL8 axis has been implicated in diverse conditions, including ischemic injury, trauma, and multiple sclerosis (MS) (Semple et al., 2010). CXCR2 has been found on astrocytes, neurons, and oligodendrocyte progenitor cells in the setting of MS and experimental autoimmune encephalomyelitis (EAE) (Semple et al., 2010); however, its exact role in disease is controversial. For example, it has been proposed that the concurrence of CXCR2 on oligodendrocytes and CXCL1 induction in astrocytes is an essential prerequisite for lesion repair (Semple et al., 2010); however, other studies have shown that blocking Cxcr2 has enhanced recovery in chronic models of EAE (Liu et al., 2010). In tumors, constitutive production of ELR+ CXC chemokines, such as CXCL1 and CXCL8, has been reported for many cancer cell types, and they can be induced by inflammatory cytokines, microbial products, and hypoxia. The chemokines are also expressed by associated stromal cells, endothelial cells, and leukocytes. CXCR1 and CXCR2 may be expressed by cancer cells, leukocytes, and endothelial cells (Waugh and Wilson, 2008; Lazennec and Richmond, 2010; Sharma et al., 2010) and may promote (1) recruitment to tumors of neutrophils, which are protumorigenic in some tumor systems but antitumorigenic in others (Fridlender and Albelda, 2012); (2) tumor cell proliferation, survival, and chemoresistance (Dhawan and Richmond, 2002); (3) osteoclastogenesis (Pathi et al., 2010); and (4) angiogenesis (Addison et al., 2000; Li et al., 2005; Keeley et al., 2010). ELR+ CXC chemokines promote angiogenesis by upregulating proliferation, survival, and migration of endothelial cells and fostering formation of capillary-like structures. Both CXCR1 and CXCR2 may be expressed by endothelial cells and mediate angiogenesis (Li et al., 2005); however, CXCR2 is considered to be more important in vivo (Addison et al., 2000; Li et al., 2005; Keeley et al., 2010). In addition to tumors, ELR+ CXC chemokines may also induce angiogenesis in inflammatory conditions, such as allergen sensitization (Jones et al., 2009), and even in the absence of any evident inflammatory insult. Unlike ELR+ CXC chemokines, most ELR-negative CXC chemokines are not angiogenic and some are angiostatic (see below). Numerous CXCR1 and CXCR2 blocking agents as well as CXCL8 inhibitors have been evaluated preclinically (Stadtmann and Zarbock, 2012); however, few have reached clinical trials (Tables 3 and 4). ABX-IL-8 (Abgenix, Fremont, CA) is a fully humanized antibody against CXCL8 that reached phase II clinical trials in psoriasis but was stopped because of lack of efficacy. In retrospect, psoriasis may not have been a good target, because neutrophils are not prominent in this disease and the receptor is not prominent on T cells, which drive the disease. Nevertheless, ABCream (Anogen, Missassauga, ON, Canada) is a topical formulation marketed in China of a CXCL8-blocking monoclonal antibody reported to be effective in psoriasis (Bizzarri et al., 2006). Anogens has indicated that ~50% of patients achieved a greater than 60% improvement, and up to 15% of patients achieved a greater than 90% improvement in disease scores after a 6-week treatment cycle. 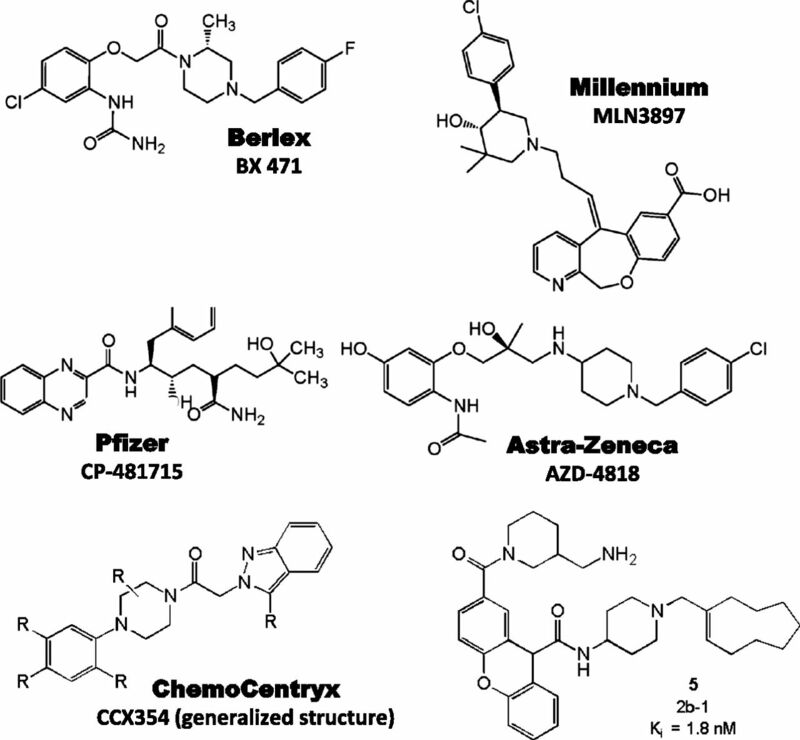 Several small molecule antagonists of CXCR1 and CXCR2 have also reached the clinic (Bizzarri et al., 2006). The first to be described in the literature was the CXCR2-selective phenol-containing diaryl urea named SB 225002 (GlaxoSmithKline, London, UK) (White et al., 1998) (Fig. 8). However, this compound and some others from this series were not developed further because of undesirable pharmacokinetics (Widdowson et al., 2004). Extensive structure-activity relationship analysis yielded the compound SB 656933 with an IC50 of 22 nM for binding to CXCR2 (Fig. 8). This compound entered clinical trials in patients with cystic fibrosis and chronic obstructive pulmonary disease (Lazaar et al., 2011), where it was found to be safe and well tolerated at all doses (2–100 mg). The observation that 2-arylpropionic acids such as ibuprofen were able to potently inhibit CXCL8-induced chemotaxis in neutrophils prompted scientists at Dompé to screen for novel inhibitors of CXCL8-induced chemotaxis (Allegretti et al., 2005; Zarbock et al., 2008). A class of derivatives of 2-arylphenylpropionic acids was extensively investigated, leading to the selection of an acyl methane sulfonamide derivative named reparixin (Dompe, Milan, Italy) (Fig. 8) as the lead compound (Allegretti et al., 2005). This compound blocks both CXCR1 and CXCR2 but is more potent at CXCR1 and inhibits CXCL8-induced neutrophil chemotaxis with an IC50 of 1 nM. It is noteworthy that it does not inhibit chemokine binding (Allegretti et al., 2005), thus, its mechanism of action may involve allostery. Two distinct allosteric sites have been proposed for CC and CXC chemokine receptors, and several preclinical allosteric antagonists or inverse agonists have been experimentally demonstrated to act through an intracellular allosteric site on CXCR2 close to the G protein-coupling region (Bradley et al., 2009; Salchow et al., 2010). Two phase II clinical trials of reparixin in kidney and lung transplantation were negative. However, after evidence of preclinical activity in islet cell transplantation, a small phase II randomized, open-label pilot study found that reparixin improved outcome with a single infusion of allogeneic islets (Citro et al., 2012); phase 3 trials are under way in the European Union for allogeneic islet transplantation and in the United States for autologous islet transplantation. In addition, a recent report suggests that it may have some utility in certain forms of breast cancer (Ginestier et al., 2010). Structure-activity studies of a lead cyclobutenedione compound enabled scientists at Schering-Plough (Kenilworth, NJ) to identify SCH-527123 (Fig. 8) as a potent, orally bioavailable dual CXCR1/CXCR2 receptor antagonist (Dwyer et al., 2006). The compound had good pharmacokinetic properties and oral bioavailability in rat and was recently tested in an ozone-induced airway neutrophilia clinical study in healthy subjects (Holz et al., 2010). The drug significantly lowered sputum neutrophil counts compared with prednisolone or placebo. Comparable results were obtained for total cell count, percentage of sputum neutrophils, and for interleukin-8 and myeloperoxidase in sputum supernatant. All treatments were safe and well tolerated. Further evaluation in a large trial of patients with pulmonary disorders is planned (Holz et al., 2010). GlaxoSmithKline (GSK) has disclosed a CXCR2 antagonist GSK-1325756B (Danarixin; Fig. 8) as a competitive, selective, and potent inhibitor that has just completed phase I studies in healthy volunteers in the United Kingdom. AstraZeneca (London, UK) disclosed an interest in CXCR2 antagonists, and their clinical compound AZD-5069 recently completed a Phase II trial in patients with bronchiectasis in February 2012 in the UK, Poland, and the Czech Republic. Interim results were summarized in Sept. 2011 in the 21st Annual Congress of the European Respiratory Society, Abstract no. P3984. A second compound, AZD-8309, was been tested in healthy volunteers in an LPS airway challenge (Virtala et al., 2012). PA401, an inhibitor of the GAG-mediated step involved in CXCL8-induced CXCR1/CXCR2 activation, is a CXCL8 variant discovered by ProtAffin (Graz, Austria) and is in development for COPD. CXCR3 is an inflammatory chemotactic receptor specific for CXCL9 (also known as monokine induced by γ-interferon), CXCL10 (interferon-induced protein of 10 kDa), and CXCL11 (I-TAC, interferon-inducible T-cell α-chemoattractant) (Loetscher et al., 1996a, 1998a; Cole et al., 1998; Lu et al., 1999). Although they share one receptor, these three ligands have nonredundant actions in vivo, the result of multiple factors, including differential ligand expression, differential binding to the receptor, and possibly additional nonshared binding sites (Groom and Luster, 2011). With regard to expression, interferon (IFN)-γ induces production of all three ligands in many cell types (Luster et al., 1985; Farber, 1990; Cole et al., 1998), but they are also differentially regulated by other stimuli, such as the type I interferons (IFNα/β) and nuclear factor κB. CXCL10 is more sensitive to innate stimuli that activate Toll-like receptor-IRF3-dependent induction of type I interferon. It is also preferentially induced by hypoxia-reperfusion injury via nuclear factor κB activation (Medoff et al., 2006) and has been shown to play an early role in the hypoxia-induced inflammation associated with solid organ transplantation, such as heart and lung (Hancock et al., 2001; Medoff et al., 2006). In contrast, CXCL9 is more dependent on and more strongly induced by IFNγ. With regard to receptor binding, there is a hierarchy of affinity and agonist potency at CXCR3, with CXCL11 > CXCL10 > CXCL9 (Cole et al., 1998; Weng et al., 1998; Cox et al., 2001; Meyer et al., 2001). Moreover, different regions of CXCR3 mediate receptor binding, activation, and internalization for each ligand. CXCR3 is tyrosine-sulfated on its N terminus, and this is required for receptor binding and activation for all three ligands, whereas the proximal 16 amino acid residues of the N terminus are required for CXCL10 and CXCL11 binding and activation, but not for CXCL9 activation (Colvin et al., 2006). Two distinct domains control internalization of CXCR3 (Colvin et al., 2004). The carboxyl-terminal domain and β-arrestin 1 are predominantly required for CXCL9- and CXCL10-directed internalization, whereas ICL3 is required by CXCL11 (Colvin et al., 2004). Structure-activity studies with CXCR3 ligands have identified unique regions in each protein that are important for binding to CXCR3 and to heparin (Campanella et al., 2003; Clark-Lewis et al., 2003; Rosenkilde et al., 2007; Severin et al., 2010). Binding of CXCL9, CXCL10, and CXCL11 to CXCR3 elicits increases in intracellular Ca2+ levels and activates PI3K and MAPK (Smit et al., 2003), and cellular responses include integrin activation, cell adhesion, cytoskeletal changes, and directed cell migration (Piali et al., 1998). N-terminal processing of CXCR3 ligands by CD26/dipeptidyl peptidase IV results in reduced CXCR3 binding, loss of calcium-signaling capacity through CXCR3, and more than 10-fold reduced chemotactic potency (Proost et al., 2001). Moreover, CXCL10 and CXCL11 cleaved by CD26/dipeptidyl peptidase IV can act as a chemotaxis antagonist of CXCR3. However, the physiologic significance of this is not known, especially because the CXCR3 binding affinity of the truncated forms is ∼10-fold less than the unprocessed forms of the CXCR3 ligands. Nonetheless, the levels of N-terminally processed CXCL10 in the peripheral blood are inversely correlated with the ability of patients to control Hepatitis C virus infection, and it has been suggested that these processed forms of CXCL10 are acting as CXCR3 antagonists and interfering with the host response to Hepatitis C (Casrouge et al., 2011). Several CC-chemokines, particularly CCL11 (eotaxin-1) and CCL13 (MCP-4), also compete with moderate affinity for the binding of CXCL10 to CXCR3 (Weng et al., 1998). CCL26 does not activate CXCR3 but, in CXCR3-transfected cells, can block CXCL10-mediated receptor activation and may therefore be a natural CXCR3 antagonist, although this has not been demonstrated in vivo. Murine CCL21 has also been shown to induce a weak calcium flux in CXCR3 transfected cells, although the physiologic significance of this interaction is not known and human CCL21 does not interact with human CXCR3 (Soto et al., 1998). CXCR3 is expressed on CD4+ Th1 cells and CD8+ cytotoxic T lymphocytes (CTL) (Loetscher et al., 1996a, 1998a; Yamamoto et al., 2000; Kim et al., 2001b). Early studies showed that T cells from inflamed peripheral tissues in human autoimmune disease are highly enriched in CXCR3 compared with circulating T cells (Loetscher et al., 1998a; Qin et al., 1998; Shields et al., 1999). Moreover, CXCR3 ligands are highly expressed in the same diseased tissues. CXCR3 is not expressed on naive T cells, but is rapidly upregulated after dendritic cell (DC)-induced T-cell activation (Sallusto et al., 1998b; Kim et al., 2001b; Xie et al., 2003). CXCR3+ cells comprise 60–90% of CD8+ memory T cells (Guarda et al., 2007; Hikono et al., 2007) and 40% of CD4+ memory T cells (Kim et al., 2003; Rivino et al., 2004). T-bet, the master transcription factor of Th1 and CTL commitment, directly transactivates CXCR3 (Lord et al., 2005; Beima et al., 2006). Mouse models have verified that CXCR3 and its ligands regulate the migration of Th1 cells into sites of Th1-driven inflammation (Khan et al., 2000; Xie et al., 2003, Campanella et al., 2008a). CXCR3 is also highly expressed on innate lymphocytes, such as NK cells and NK T cells (NKT), where it may mediate early recruitment to sites of infection and inflammation (Qin et al., 1998; Thomas et al., 2003). It is also expressed on plasmacytoid DCs and subsets of B cells, where it may direct migration to inflamed lymph nodes (Cella et al., 1999; Nanki et al., 2009). Tregs that accumulate at sites of Th1 cell-mediated inflammation have been reported to express the signature Th1 transcription factor T-bet, which is required for CXCR3 expression by these cells and for regulatory function (Koch et al., 2009). This may partially explain modest decreases in T-cell entry in mouse models in which CXCR3 is genetically or pharmacologically inactivated, despite high expression of CXCR3 receptor and ligands in the target tissue. Cxcr3 is required on CD8+ cells for infiltration into the brain during Plasmodium berghei ANKA infection for the development of cerebral malaria symptoms (Campanella et al., 2008b; Miu et al., 2008). Cxcr3−/− mice are protected from cerebral malaria because of reduced CD8+ CTL sequestration in the brain. The CXCR3 system also participates in the acute response in the brain to Toxoplasma gondii (Khan et al., 2000) as well as in CD8+ T-cell-mediated immunosurveillance of the brain during the chronic phase (Harris et al., 2012). T-cell infiltration of mucosal tissues is also highly dependent on CXCR3. This is true during herpes simplex virus-2 infection of the vaginal mucosa (Thapa et al., 2008; Nakanishi et al., 2009; Thapa and Carr, 2009) and during colitis. In the IL-10 null inflammatory bowel disease model, Cxcl10 and Cxcr3 are highly expressed at sites of colitis because of local production of the ligands, leading to the recruitment of Cxcr3+ T cells. In this model, Cxcl10 neutralization was beneficial (Singh et al., 2008b). In the adoptive transfer model of colitis, CD4+CD25 T cells require expression of Cxcr3 to cause disease in Rag1−/− mice. Interestingly, transfer of Tregs for disease protection in this model does not require Cxcr3, indicating that these different subsets gain access to different locations during disease (Kristensen et al., 2006). Accumulation of effector T cells at sites of autoimmune inflammation is strongly correlated with CXCR3 expression. In addition to autoimmune rheumatoid arthritis (RA) synovium where CXCR3-expressing cells were first characterized in a human disease (Qin et al., 1998) and subsequently shown to regulate T-cell recruitment in murine models (Salomon et al., 2002; Mohan and Issekutz, 2007), deficiency in CXCR3 also reduces autoimmune diabetes and infiltration of T cells into the kidney in systemic lupus erythematosus (Frigerio et al., 2002; Menke et al., 2008; Steinmetz et al., 2009). More recent data have also indicated an important role for CXCR3 in primary and secondary lymphoid organs. 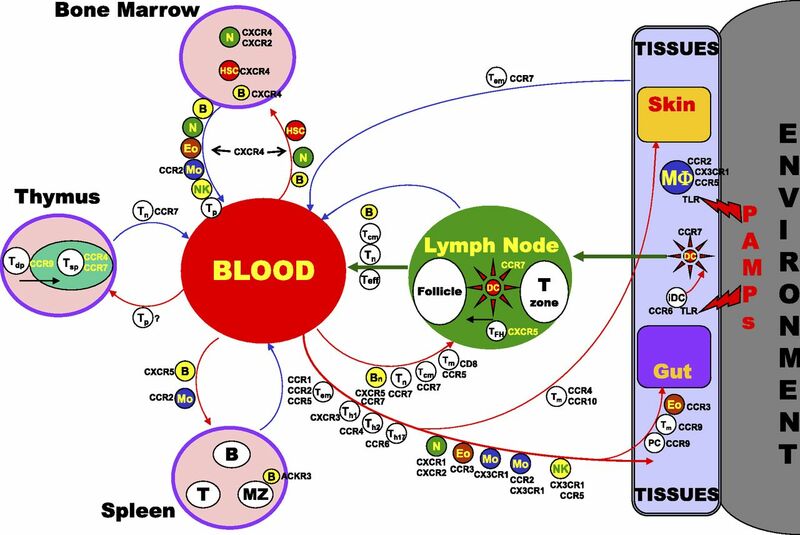 CXCR3 ligands are highly upregulated in the lymph node after infection and immunization, and recent studies have demonstrated a role for CXCR3 in the movement of recently activated CD4+ T cells and central memory CD4+ T cells out of the T-cell zone and into the interfollicular and medullary regions of lymph nodes where they come in contact with antigen-activated innate immune cells (Groom et al., 2012; Sung et al., 2012; Kastenmuller et al., 2013). Similar results have been seen in the spleen where Cxcr3 plays an important role in bringing CD8+ T cells into contact with antigen and inflammatory cytokines after lymphocytic choriomeningitis infection and vaccinia virus infection (Hu et al., 2011; Kurachi et al., 2011). In these models, Cxcr3 deficiency of CD8+ T cells leads to ineffective effector T-cell generation and a resultant expansion of the memory pool. The CXCR3 ligands are basic proteins that bind avidly to negatively charged glycosaminoglycan (GAG) molecules both on the surface of cells and in the extracellular matrix (Luster et al., 1995; Campanella et al., 2003; Severin et al., 2010). GAG binding is thought to be important for the retention and presentation of chemokines to their chemokine receptors in vivo. Although the in vitro chemotactic activity of CXCL10 and CXCL11 was shown to be GAG binding-independent, the ability of these chemokines to induce CXCR3-dependent T-cell migration in vivo was shown to be dependent on their ability to bind GAGs (Campanella et al., 2006; Severin et al., 2010). The ability of CXCR3 ligands to influence the behavior of certain nonimmune cells, such as endothelial cells and fibroblasts, that do not express CXCR3, has been shown to be a function of the ability of these chemokines to bind to cell surface GAGs (Luster et al., 1998; Proost et al., 2001; Tager et al., 2004; Campanella et al., 2010; Jiang et al., 2010). However, this conclusion is controversial. The identification of an alternative splice variant of CXCR3, termed CXCR3-B, specifically in human endothelial cells, was suggested as a possible explanation for CXCL10’s angiostatic effects (Lasagni et al., 2003). Translation of the putative human CXCR3-B splice variant results in an extracellular N terminus that is 48 amino acids longer than the originally described CXCR3 receptor (referred to as CXCR3-A), with the remaining sequence identical to CXCR3-A. CXCL9, 10, and 11 were shown to bind to CXCR3-B. In addition, CXCL4 (platelet factor 4) was shown to weakly bind CXCR3-B, although subsequent studies using transfected cells found that it binds CXCR3-A with the same low affinity as CXCR3-B and that binding was chiefly mediated by cell surface GAGs (Mueller et al., 2008). Furthermore, although CXCL4 induced intracellular calcium mobilization and Akt and p44/p42 extracellular signal-regulated kinase phosphorylation in activated human T lymphocytes, it failed to elicit migratory responses and did not lead to loss of surface CXCR3 expression, raising doubt about the in vivo functional significance of this interaction (Korniejewska et al., 2011). CXCR3-B has been described to mediate the angiostatic effect of its ligands, being the preferential CXCR3 receptor reported to be expressed on endothelial cells. Strikingly, overexpression of CXCR3-B in an endothelial cell line resulted in CXCL10 inhibiting proliferation, whereas overexpression of CXCR3-A in the same cell line resulted in CXCL10 augmenting proliferation (Lasagni et al., 2003). Although the existence of an alternative splice variant of CXCR3 provides a possible explanation for the different functions of CXCL10, it is unclear how a difference in only the N-terminal extracellular domain of CXCR3-A results in intracellular signaling that was purported to oppose CXCR3-A signaling. 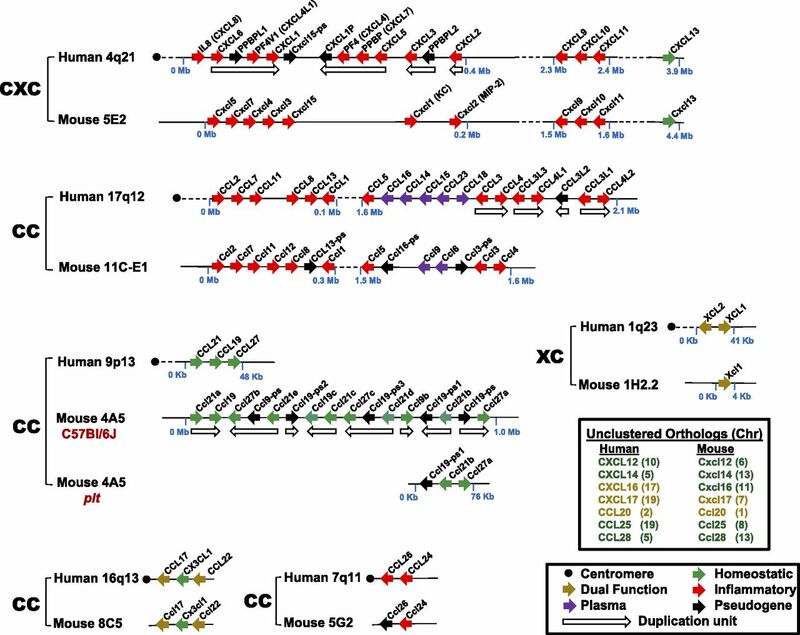 In addition, although CXCL10’s antiproliferative effects on endothelial cells have been described in mice, the alternative CXCR3-B variant does not exist in mice, as an in-frame stop codon before the conserved sequence would terminate an analogous CXCR3-B splice variant in mice (Campanella et al., 2010). Furthermore, CXCL10 is capable of inhibiting the proliferation of murine endothelial cells that were deficient in CXCR3, and the presence of CXCR3 protein on the surface of human endothelial cells is controversial. Experiments with human endothelial cells also demonstrate that CXCL10 can inhibit endothelial cell proliferation independent of CXCR3 (Campanella et al., 2010). CXCR3-alt is a polymerase chain reaction (PCR)-generated splice variant of CXCR3 encoding a truncated receptor that has not been shown to signal or to be expressed in primary cells (Ehlert et al., 2004). Thus, the existence, relevance, and importance of putative alternate splice forms of CXCR3 remain to be established. Several synthetic CXCR3-specific small molecule antagonists have been developed that show efficacy in animal models. SCH 546738 from Merck binds to human CXCR3 with high affinity (kD = 0.4 nM) and displaces radiolabeled CXCL10 and CXCL11 from human CXCR3, with an IC50 ranging from 0.8 to 2.2 nM in a noncompetitive manner (Jenh et al., 2012). SCH 546738 potently and specifically inhibits CXCR3-mediated chemotaxis of human activated T cells, with an IC90 of ~10 nM. SCH 546738 attenuated disease development in a mouse collagen-induced arthritis model and reduced disease severity in rat and mouse EAE models. Furthermore, SCH 546738 alone achieved dose-dependent prolongation of rat cardiac allograft survival, and similar to what was seen with the Cxcr3−/− mouse, SCH 546738 in combination with CsA supported permanent engraftment. 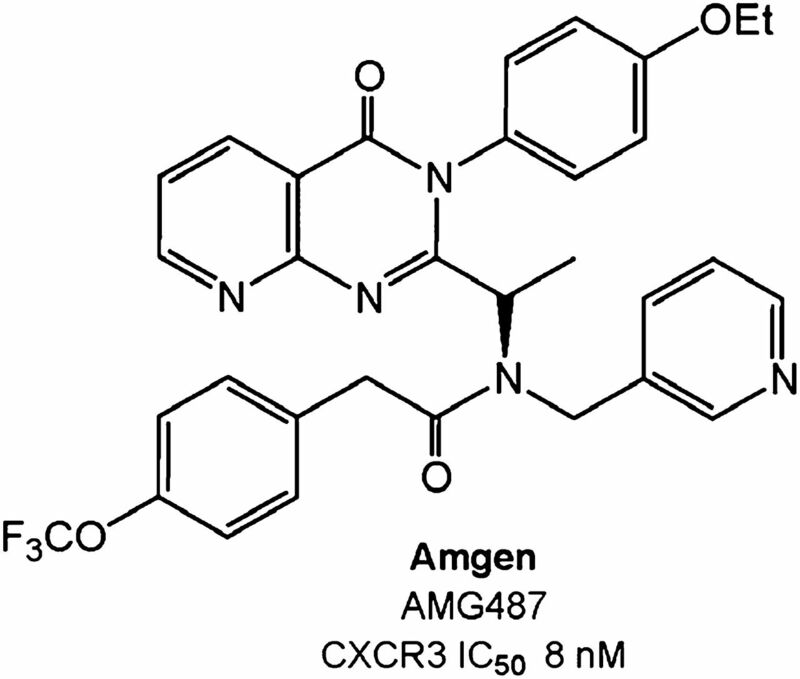 Amgen Pharmaceuticals has developed small (aza)quinazolinone-based CXCR3 antagonists, the best characterized of which is AMG487, a noncompetitive antagonist (Liu et al., 2009) (Table 3; Fig. 9). It potently inhibits CXCL11-mediated cell migration (IC50 = 15 nM) and calcium mobilization (IC50 = 5 nM) and exhibits >1000-fold selectivity over a panel of other chemokine receptors. In preclinical studies, AMG 487 blocked immune cell migration and demonstrated excellent potency, high selectivity, and good oral bioavailability (Johnson et al., 2007). The drug dose-dependently inhibited cellular infiltration of immune cells into the lungs in a bleomycin-induced model of inflammation in mice. A twice daily dose of 3 mg/kg s.c. was as effective in inhibiting immune cell migration into the lungs as genetic inactivation of Cxcr3. The compound entered phase II clinical trials for the treatment of psoriasis but failed to demonstrate any signs of efficacy, and the trial was terminated (Horuk, 2009). An analog of AMG487 prolonged cardiac allograft survival in a mouse model and decreased the frequency of interferon-γ-producing cells in the recipient spleen (Rosenblum et al., 2009). CXCR3 blockade for 30 days synergized with short-term, low-dose anti-CD154 monoclonal antibodies to prolong survival past 50 days in 75% of grafts and past 80 days in 25% of the cases. Medarex has generated a neutralizing monoclonal antibody, MSX-1100, to the CXCR3 ligand CXCL10. The drug had low nanomolar affinity for CXCL10 and was safe in humans. In phase II clinical trials, it demonstrated efficacy in rheumatoid arthritis (Yellin et al., 2012) but not in ulcerative colitis (Bosworth, 2010). CXCR4 and ACKR3 (CXCR7) are the two most highly conserved chemokine receptors among vertebrates and are essential for life in mice (Fig. 5) (Tachibana et al., 1998; Zou et al., 1998; Sierro et al., 2007). They share the key homeostatic ligand CXCL12, also known as stromal cell-derived factor-1 (SDF-1), and in some settings act cooperatively. CXCR4 is a classic GPCR, whereas ACKR3 (CXCR7) is an atypical receptor signaling in a non–G protein-dependent manner (Fig. 6; see below). CXCR4 is the only known G protein-coupled chemokine receptor for CXCL12, which is constitutively secreted by bone marrow (BM) stromal cells and many other cell types in many other tissues. CXCL12 binding to CXCR4 can activate all signal transduction pathways typical for chemokine receptors, including adhesion, chemotaxis, survival, and proliferation (Busillo and Benovic, 2007). Six different splice variants of CXCL12 have been reported, which all vary exclusively in the extreme C terminus. The differences in the C termini, not being involved in either binding site one or two of CXCR4, have minor effects on receptor interaction. Most common are CXCL12α and CXCL12β. The extended C terminus of the γ-isoform contains several basic amino acids, has a marked affinity for GAGs, which fosters efficient formation of chemokine gradients (Rueda et al., 2008), and is important for revascularization and infiltration of cells into ischemic tissue (Rueda et al., 2012). The other CXCL12 variants (δ–θ) are poorly characterized. Several nonchemokine ligands also bind CXCR4. Most important is the envelope protein gp120 of CXCR4 (X4)-tropic HIV. gp120 binds sequentially to CD4 and CXCR4 to allow gp41-guided virus entry. Accordingly, infection with X4-tropic HIV strains is abolished by downregulation of CXCR4 on CD4+ cells (Wilen et al., 2012) and inhibited by CXCL12 (Oberlin et al., 1996). Thus, CXCR4 is referred to as an HIV coreceptor. HIV-1 Env and its subunit gp120 can elicit a complex cellular response that mimics the effects of a chemokine, but whether Env-mediated signaling affects HIV infection and pathogenesis remains unknown (Balabanian et al., 2004; Melar et al., 2007; Wu and Yoder, 2009). Inflammatory cytokines and danger molecules released from damaged cells or tissues can bind and activate CXCR4, including the pleotropic cytokine macrophage migration inhibitory factor (Bernhagen et al., 2007), extracellular ubiquitin (Saini et al., 2011), and high mobility group protein B1 (HMGB1). HMGB1 is a highly conserved nuclear protein known to act as a damage-associated molecular pattern after release from dead cells. It binds CXCL12 and shifts the efficiency of CXCR4 activation to lower concentrations of CXCL12 (Schiraldi et al., 2012). CXCR4-mediated signal transduction induced by its nonchemokine ligands triggers chemotaxis and conforms to the classic chemokine signal transduction pathway (Thelen, 2001). CXCR4 is the first chemokine receptor for which highly diffracting crystals have been reported. A heptahelical structure was confirmed from five different crystal structures of the receptor in complex with a small-molecule antagonist (IT1t, an isothiourea derivative) and/or with the cyclic peptide antagonist CVX15 derived from Limulus polyphemus (Wu et al., 2010) (Fig. 2). Overall the conformation of the core of CXCR4 in the crystals bound to IT1t is highly conserved (less than 0.6Å root mean square deviation), but shows slight differences when in complex with the larger molecule CVX15. Compared with other available GPCR structures, CXCR4 displays some unique structural characteristics, which cautions modeling other chemokine receptors on available GPCR structures. Most important is the relative orientation of the helices with their extension into the extracellular and intracellular space. The extracellular end of helix VII reaches two turns longer into the extracellular space than in other GPCRs and ends with a cysteine that forms a second extracellular disulfide bridge with Cys28 located in the N terminus. The distinct extracellular architecture of CXCR4 is consistent with the large size of its ligand CXCL12 compared with ligands of other crystallized GPCRs. In particular, ECL2 makes extensive contact with CVX15 in the crystal structure. The interaction with CVX15 presumably mimics the binding of CXCL12 where the N terminus of the chemokine falls deeply into the binding pocket. In addition, CXCR4 lacks the short helix VIII located in the C terminus proximal to helix VII of other crystallized GPCRs. The region in question of CXCR4 shows some homology to the canonical sequence, leaving the possibility that the C terminus might fold into a short helix depending on the local environment, as exemplified recently for the three-dimensional structure of CXCR1 in a phospholipid bilayer by NMR spectroscopy (Park et al., 2012). Moreover, CXCR4 lacks a palmitoylation consensus in the C terminus, which in other class A receptors hooks the C terminus to the membrane (Wu et al., 2010). In most available crystal structures, GPCRs orient in a nonfunctional manner (e.g., antiparallel), precluding any conclusions about possible receptor dimerization. However, in the case of CXCR4, a distinct contact site comprising helix V and VI is found in five different crystal packings. The strongest interaction of two receptor protomers is mediated by hydrophobic side chains of amino acids located in helix V with some participation of Lys267 from helix VI (Wu et al., 2010). The proposed homodimeric structure of CXCR4 is consistent with predictions made from detergent-solubilized receptor (Babcock et al., 2003). Many reports using overexpression systems suggest that CXCR4 arranges in heterodimers with some, but not all, chemokine receptors; however, whether this occurs in primary cells for receptors at natural abundance remains unknown (Thelen et al., 2010). The hydrophobic side chains, which form the dimer interface in CXCR4, are poorly conserved in other chemokine receptors, so it is unlikely that potential heterodimers, including CXCR4 would display a structure similar to the CXCR4 homodimer. The X-ray data of CXCR4 provide further support for the “two-step” binding model of CXCL12, where the core domain of the chemokine binds to site one in the N terminus of CXCR4 and the N terminus of the chemokine binds site two (Crump et al., 1997). NMR studies of the N terminus of CXCR4 (p38) in complex with CXCL12 are consistent with site one. Of note is the role of the tyrosine residues in the N terminus of CXCR4 (particularly Tyr21 and to a lesser extend Tyr12 and Tyr7), which can undergo post-translational sulfation in the Golgi apparatus. The acidic modification of the tyrosine residues enhances the affinity for the basic chemokine (Seibert et al., 2008). Fully sulfated CXCR4 p38 tends to promote CXCL12 dimerization, but the dimeric chemokine is only a partial agonist at CXCR4, not inducing chemotaxis but maintaining the ability to mobilize calcium (Drury et al., 2011). The crystal structure of CXCR4 can accommodate several receptor-chemokine combinations, including monomeric (CXCL12:CXCR4), dimeric CXCL122:CXCR42), or mixed (CXCL12:CXCR42) conformations (Wu et al., 2010), thus leaving open the exact stoichiometry of a functional receptor ligand complex. Taken together, the X-ray data unveil multiple potential receptor conformations and ligand interactions, which add to the complexity of context-dependent CXCR4-mediated signal transduction. Some prudence should be exercised in interpretation of the structural data, insofar as all crystal structures of GPCRs, including CXCR4, are obtained with extensively modified receptors, i.e., truncation at the N and C termini as well as insertion of stabilizing amino acids and sequences in the third intracellular loop. This could explain the differences noted in the structure of CXCR1, solved by NMR spectroscopy for an unmodified unliganded receptor in liposomes (Park et al., 2012). In jawed vertebrates, CXCR4 is expressed throughout development and is the only G protein-coupled chemokine receptor essential for life. The protein is widely expressed on nondifferentiated and differentiated tissues. CXCR4 is found on almost all hematopoietic cells, vascular endothelial cells, in neurons of the central and peripheral nervous system, microglia, and astrocytes (Murphy et al., 2000). It is also functionally expressed by many cancer cells of hematopoietic and nonhematopoietic origin (Balkwill, 2004). Presumably in context with specific adhesion molecules, CXCR4, in addition to promoting survival and growth, may direct metastasis to selected CXCL12-rich organs, e.g., osteosarcoma to the lungs; breast cancer to BM, lung, and liver; and prostate cancer mostly to BM. A role of CXCR4 in lymph node metastasis is not clear despite the pronounced expression of the chemokine. It appears that other chemokine receptors, such as CCR7, may play a more decisive role there (Balkwill, 2004). The main activities associated with CXCR4 are cell migration (homing) and positioning (homeostasis), neovascularization, survival, and growth. This wide spectrum of activities is unique for chemokine receptors and suggests distinctive signal transduction properties. However, CXCR4 shares the activation of downstream signaling pathways with other typical chemokine receptors. The receptor couples to pertussis toxin sensitive Gi proteins, stimulates phospholipase C leading to calcium mobilization, triggers the MAPK cascade and the protein kinase B/PI3K pathway, and activates arrestin-dependent signaling (Busillo and Benovic, 2007). The unique signaling properties probably do not depend on the activation of these common pathways, but instead on the context of CXCR4, differences in length of stimulation and coupling efficiency, and the interaction with specific proteins (Thelen and Stein, 2008). The proposed dimeric architecture may not be shared by other chemokine receptors and thus may provide a unique docking platform. In addition, CXCR4 signaling is context-dependent, e.g., in B-cell subsets the receptor does not trigger calcium mobilization or chemotaxis, despite surface expression and signaling competence of the cells. The concentration and aggregation state of CXCL12 also contributes to the signaling quality (see above). Context might also be given by neighboring chemokine receptors that might even form functional heterodimers, as recently proposed in support of the observation that small molecule antagonists can inhibit the function of chemokine receptors on which they do not directly bind (Sohy et al., 2009). Molecular characterization of potential receptorsomes from primary cells remains important work for the future. CXCR4 plays key roles in immune system development during both lymphopoiesis and myelopoiesis (Fig. 7). The receptor retains hematopoietic precursors in the BM, mediates B-cell segregation in lymphoid organs and mediates neutrophil egress from BM and BM homing of senescent neutrophils (Murphy et al., 2000). Cxcr4-deficient mice exhibit defective bone marrow myelopoiesis and B-cell lymphopoiesis, as well as developmental defects in the brain, heart, and stomach vasculature. CXCR4 signaling may also be important in naive and memory B-cell trafficking to germinal centers. Mice harboring a CXCL12-promoted gain of function for Cxcr4 exhibited abnormal compartmentalization of B cells in the periphery, with a reduction of primary follicles in the spleen and their absence in lymph nodes (Balabanian et al., 2012). In humans, WHIM syndrome, a rare immunodeficiency disorder, is the only disease shown to be caused by Mendelian inheritance of mutations in a chemokine system element (Table 5). WHIM is an acronym for warts caused by human papillomavirus infection, hypogammaglobulinemia, infections, and myelokathexis (abnormal retention of senescent neutrophils in the BM, which is associated with panleukopenia). Almost all known WHIM mutations result in partial truncation of the C terminus of CXCR4, which leads to agonist-stimulated gain-of-function for the receptor (Hernandez et al., 2003). The mechanism involves enhanced G protein coupling as well as arrestin-dependent signaling (Lagane et al., 2008) and loss of phosphorylation sites on the C terminus important for receptor desensitization and internalization (Busillo and Benovic, 2007), causing retention of mature leukocytes in the BM and possibly in other immune organs (Hernandez et al., 2003; Gulino et al., 2004; Balabanian et al., 2005b; Kawai et al., 2007). However, patients are able to mobilize leukocytes to the blood during infections and therefore develop recurrent bacterial infections that are usually not life threatening, and may survive into adulthood. Thus, the apparent paradox of patients with WHIM syndrome is to exhibit a profoundly altered immune function and yet a limited susceptibility to viral and bacterial pathogens, with the notable exception of human papillomavirus (Beaussant Cohen et al., 2012), the signature pathogen in WHIM syndrome. This may eventually be a consequence of altered immune responses (Tassone et al., 2010) and the hijacking of the CXCL12/CXCR4 signaling axis as a host susceptibility factor for the virus (Chow et al., 2010). Given the importance of CXCR4 in HIV infection and its putative involvement in cancer, attempts have been made to identify inhibitors (Table 3). 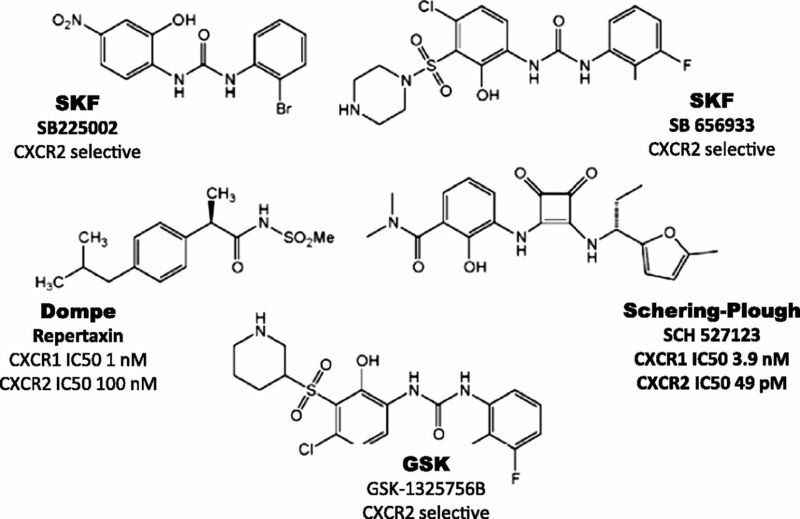 The class of peptide-based CXCR4 inhibitors consists of antibodies, chemokine analogs, derivatives of the horseshoe crab protein polyphemusin, and endogenous defensins. From the latter group of molecules several can block HIV replication, but only human β defensin-3 efficiently competes for CXCL12 binding at CXCR4 (Feng et al., 2006). Human β defensin-3 downregulates CXCR4 without activating canonical Gi-coupled signal transduction, a rare property for a GPCR. Cyclic polyphemusin peptide inhibitors include T22 ([Tyr5,12, Lys7]-polyphemusin II), T134, T140, and their derivatives (Liang, 2008). From this group, the 14-amino acid polypeptide 4F-benzoyl TN14003 (BKT140) (Beider et al., 2011) is currently in phase I/II clinical trials for multiple myeloma after chemotherapy and BM transplantation. Inhibitory CXCL12 analogs, designed based on the importance of the N terminus for receptor activation but not for binding (Liang, 2008), include P2G-CXCL12 (where Pro2 is replaced with Gly) (Crump et al., 1997), (1–9)P2G2 (a short dimeric peptide that lacks the chemokine core domain (Loetscher et al., 1998b), and a 10-residue substituted dimer derived from the amino acid 5–14 sequence of CXCL12 (Heveker et al., 2001). From the panel of available antibodies that efficiently block CXCR4, the best characterized is the mouse mAb 12G5. This antibody binds to a conformational epitope on human CXCR4 comprising ECL2 and ECL3 and inhibits HIV and CXCL12 binding. For clinical applications, the fully human anti-CXCR4 (IgG4) from Bristol-Myers Squibb (BMS; Princeton, NJ) (BMS) and Medarex (Princeton, NJ) (BMS-936564/MDX-1338) is currently being tested for treatment of multiple myeloma (phase 1) after proof-of-principle studies indicating that detachment from bone marrow stromal cells may sensitize cancer cells to chemotherapy (Azab et al., 2009; Kuhne et al., 2013). Recently, a phase I clinical trial in healthy volunteers was completed by Ablynx (Ghent, Belgium) to test the safety of a llama-derived CXCR4-targeted nanobody, ALX-0651, after proof-of-principle studies of this approach in blocking chemotaxis and HIV and mobilizing stem cells (Jahnichen et al., 2010). Virus-derived chemokine-binding proteins (vCKBP) display diverse mechanisms of interfering with chemokine receptor signaling. The herpes simplex virus 1 and 2 proteins gG1 and gG2 bind CXCL12α and β, thereby enhancing chemokine-induced CXCR4 signaling. Both vCKBPs increase the chemotactic potency and directionality of CXCL12-induced migration (Viejo-Borbolla et al., 2012). By contrast, ectromelia virus-derived E163 does not interfere with binding and triggering of CXCL12 at CXCR4, but instead masks the GAG binding site of the chemokine, preventing adhesion to cell surfaces, which is important for the formation of chemotactic gradients (Ruiz-Arguello et al., 2008). Kaposi's sarcoma-associated herpesvirus (HHV8)-encoded vMIP-II (vCCL2) is a strong antagonist of CXCR4, preventing binding of CXCL12 and activation of the receptor. vMIP-II also inhibits CXCR4-mediated cell entry of HIV (Kledal et al., 1997). Low molecular weight antagonists of CXCR4 (Liang, 2008) include the bicyclam AMD3100 (plerixafor or Mozobil; Sanofi, Paris, France), which reversibly binds CXCR4 and blocks CXCL12 binding and HIV infection (De Clercq, 2009) (Fig. 5). It also promotes leukocytosis, including release of precursors from bone marrow niches. In this regard, in 2009 the FDA approved plerixafor in combination with granulocyte macrophage colony-stimulating factor (GM-CSF) for mobilization of stem cells for BM transplantation in patients with multiple myeloma and non–Hodgkins’ lymphoma receiving cytoreductive therapy (Pusic and DiPersio, 2010). Currently, another clinical trial is underway testing small doses of plerixafor as mechanism-based treatment to dial down hyperfunctional CXCR4 signaling in WHIM syndrome. Repeated administration of plerixafor is well tolerated and leads to decreased leukopenia (Dale et al., 2011; McDermott et al., 2011). A related substance of lower molecular weight and charge, the monocylam AMD3465, also potently inhibits CXCR4 (Bodart et al., 2009). The non–cyclam AMD11070 (ritonavir) is the first orally bioavailable small molecule CXCR4 inhibitor introduced to the clinic. Early results indicate that it is well tolerated (Moyle et al., 2009). Another unrelated chemical structure, the chalcones, also inhibit CXCL12 binding and activation of CXCR4 but by neutralizing CXCL12 (Hachet-Haas et al., 2008). The success of plerixafor has paved the way for a number of companies to target CXCR4. Among these is TaiGen with their CXCR4 antagonist TG-0054 (burixafor). The structure of the drug has not yet been disclosed, but TaiGen has disclosed polyamine and pyrimidines as CXCR4 antagonists in patent applications. Phase I clinical trials revealed that single-dose administration of the antagonist more than increased the number of circulating stem cells to the numbers required for a successful transplant. Currently, the antagonist is undergoing several phase II clinical trials for the treatment of multiple myeloma and non–Hodgkin’s lymphoma. Isothioureas have better biopharmaceutical properties than plerixafor and are orally bioavailable. A primary compound (IT1a, NIBR1816) and several chemical derivatives, the most potent being IT1t, which were used for CXCR4 crystallization (Thoma et al., 2008), have potent anti-HIV activity, compete with CXCL12 binding in the nanomolar range, and mobilize hematopoietic stem cells (Fiorina et al., 2011). The CXCR4 antagonist described by Polyphor, POL6326, is derived from their proprietary technology, known as Protein Epitope Mimetics (DeMarco et al., 2006). According to the company, POL6326 has successfully completed phase I clinical trials in the United Kingdom with 74 healthy volunteers. The drug was safe and well tolerated and is currently being investigated in a phase II clinical trial for safety and efficacy in transplantation of autologous hematopoietic stem cells in patients with multiple myeloma after chemotherapy. Two other CXCR4-blocking approaches in the clinic are worth mentioning. The first is a peptide, BKT140, that is reported to block CXCR4 and is in phase I clinical trials (Burger et al., 2011). The second is NOX-A12, which is a mirror image RNA of the RNA for the chemokine CXCL12, thus blocking expression of the protein and preventing receptor engagement. Phase I clinical studies were safe, and the company is currently assessing this molecule in phase II clinical trials for the treatment of multiple myeloma and chronic lymphocytic leukemia. CXCR5 is a homeostatic receptor that binds monogamously with the chemokine CXCL13 and regulates adaptive immunity (Gunn et al., 1998; Legler et al., 1998). It was the first chemokine receptor shown to be involved in lymphocyte homing and development of normal lymphoid tissue (Forster et al., 1996) and the first B-cell-selective chemokine receptor (Forster et al., 1994; Gunn et al., 1998; Legler et al., 1998). CXCR5 has been detected on all peripheral blood and tonsillar B cells, but not on plasmablast and plasma cells and only on a fraction of cord blood and bone marrow B cells (Wehrli et al., 2001; Shaffer et al., 2002). It is also present on a small subset of peripheral blood memory CD4+ and CD8+ T cells. In contrast, in secondary lymphatic tissue, the majority of CD4+ T cells are positive, and in cord blood T cells are negative (Kaiser et al., 1993; Forster et al., 1994). Similar to other chemokine receptors, CXCR5 is dynamically regulated on T cells. After TCR stimulation, CXCR5 is upregulated on memory/effector T cells, whereas IL-2 causes downregulation (Sallusto et al., 1999). CXCL13 is produced selectively by high endothelial venule endothelial cells and follicular stromal cells and is constitutively displayed on follicular HEV. The CXCL13/CXCR5 axis supports ∼50% of the signaling required for B-cell entry from blood to Peyer’s patch; CXCR4 may also contribute (Okada et al., 2002, 2005). In Cxcr5−/− mice, B cells do not migrate to lymph node, Peyer’s patches are abnormal, and inguinal lymph nodes are absent. CXCL13 is also required for B1 cell homing, natural antibody production, body cavity immunity, and lymphoneogenesis in the setting of autoimmunity (Luther et al., 2000; Ansel et al., 2002). Cxcr5−/− mice still can produce antibody, perhaps in part because B cells and follicular DCs, by an unknown mechanism, are able to form ectopic germinal centers within T zones of the periarteriolar lymphocyte sheath of spleen. No CXCR5 antagonists have been developed yet; however, targeting this receptor in autoimmunity is an attractive direction for the future. Human CXCR6 is located on chromosome 3 (Liao et al., 1997b; Loetscher et al., 1997) at 3p21.31, between CCR9 and XCR1, in the cluster that contains CC, XC, and CX3C (but not CXC) chemokine receptors (Fig. 3). It is notable that in phylogenetic analysis, CXCR6 is most closely related not to other CXC receptors but instead is in a cluster with CCR6, CCR7, and CCR9 and is closest either to CCR6 (Lio and Vannucci, 2003) or CCR9 (Nomiyama et al., 2011), depending on the analysis. CXCR6 has orthologs in multiple species, including reptiles (Nomiyama et al., 2011). Human (and mouse) CXCR6 are unusual in having a DRF sequence in place of the canonical DRY motif at the end of the third transmembrane helix. CXCR6 has a monogamous relationship with CXCL16, which binds with a Kd of 1 nM (Matloubian et al., 2000; Wilbanks et al., 2001). Analogous to its receptor, CXCL16 is an unusual chemokine. 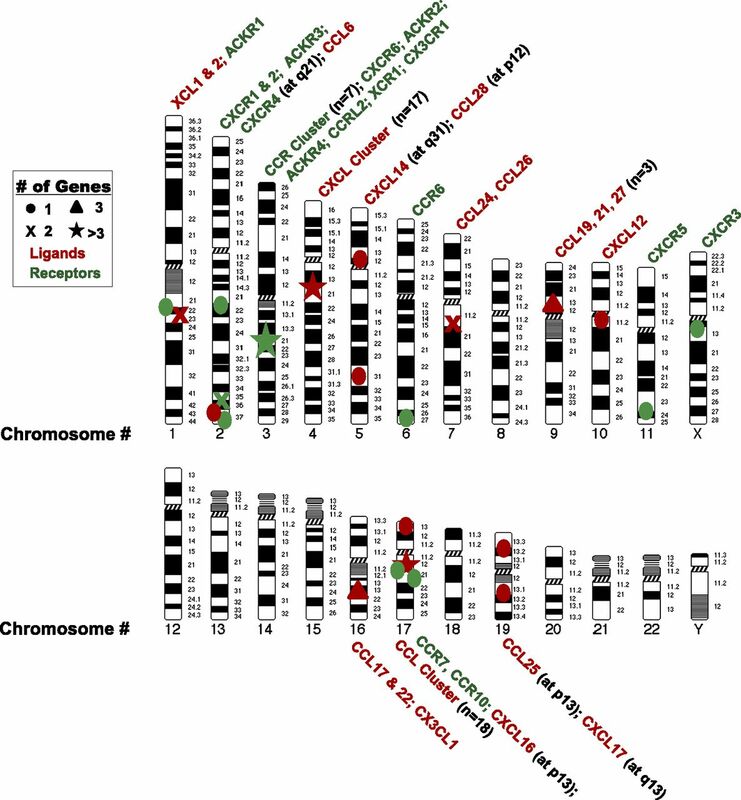 CXCL16 is found at 17p13.2, separate from the genes for other chemokines, and phylogenetic analysis shows that CXCL16 is not closely related to other CXC chemokines (Fig. 4) (Huising et al., 2003). CXCL16’s most striking feature is a transmembrane domain (Fig. 2), and CXCL16 can be found in both membrane-bound and soluble forms, with the latter generated from the former by the proteolytic activity of ADAM10 (Abel et al., 2004). Immobilized CXCL16 has been reported to mediate CXCR6-dependent adhesion in the absence of CXCR6 signaling in some systems (Nakayama et al., 2003; Shimaoka et al., 2004), although in other cases adhesion required CXCR6-induced integrin activation (Heydtmann et al., 2005). CXCL16 is additionally notable in that it was discovered independently of its chemokine activity as a scavenger receptor and was originally designated as SR-PSOX (an acronym for “scavenger receptor for phosphatidyl serine and oxidized low-density lipoprotein”) (Shimaoka et al., 2000). CXCR6 is expressed on T cells, including γ/δ T cells (Deng et al., 1997; Liao et al., 1997b; Unutmaz et al., 2000), as well as on NKT cells (Kim et al., 2002), NK cells, and plasma cells (Nakayama et al., 2003). Outside of the hematopoietic compartment, CXCR6 has also been found on epithelial and nonepithelial cancers (Wang et al., 2008; Darash-Yahana et al., 2009; Gao et al., 2012). CXCL16 is expressed on antigen-presenting cells such as dendritic cells, monocyte/macrophages, and possibly B cells (Matloubian et al., 2000; Shimaoka et al., 2000; Wilbanks et al., 2001), as well as on fibroblastic reticular cells, activated T cells (Darash-Yahana et al., 2009), endothelial cells (Abel et al., 2004), and cancer cells (Hojo et al., 2007; Darash-Yahana et al., 2009; Gao et al., 2012). CXCR6 was initially identified as an entry coreceptor on T cells, along with CD4, for strains of HIV-1 and simian immunodeficiency virus (Alkhatib et al., 1997; Deng et al., 1997; Liao et al., 1997b), and also can be used by primary isolates of HIV-2, particularly those isolated from individuals without plasma viremia (Blaak et al., 2005). Although studies have reported primary isolates of HIV-1 that are able to use CXCR6 in virus entry (Isaacman-Beck et al., 2009; Zhang et al., 2001b) and infection assays (Sharron et al., 2000), there is no established role for CXCR6 in supporting viral infection in vivo. Nevertheless, a polymorphism that results in a nonconservative change in the CXCR6 N terminus was associated with improved survival after infection with Pneumocystis carinii in a group of HIV-infected African-American intravenous drug users (Duggal et al., 2003). In addition, a single nucleotide polymorphism in the 3′-nontranslated region of CXCR6 has been associated with long-term nonprogression to AIDS in several cohorts (Limou et al., 2010). Whether these associations are related to CXCR6 activity as an HIV coreceptor or, perhaps more likely, its activity in the host immune system remains unresolved. CXCR6 expression on human CD4+ T cells is restricted to the effector/memory population and has been associated with the Th1 and Th17 phenotypes (Kim et al., 2001a; Annunziato et al., 2007; Singh et al., 2008a). CXCR6 is significantly enriched on both CD4+ and CD8+ T cells found in inflamed tissue, such as joints in rheumatoid and psoriatic arthritis (Kim et al., 2001a). CXCR6 is expressed on mouse (Johnston et al., 2003) and human (Kim et al., 2002) NKT cells and is important for survival and activation of liver NKT cells in mice (Geissmann et al., 2005; Germanov et al., 2008). CXCR6 is also important for the maintenance of “memory” NK cells in the liver, which can confer pathogen-specific protection (Paust et al., 2010). Recent work suggests that CXCR6/CXCL16 are important for regulating NKT cell accumulation in colon and lung in mice and that CXCL16 expression at these sites is downregulated by neonatal colonization with bacterial flora (Olszak et al., 2012). Germ-free mice showed increased numbers of NKT cells at these sites that led to exaggerated susceptibilities in models of colitis and asthma (Olszak et al., 2012). A number of studies have suggested roles for CXCR6 and CXCL16 in cancer, although the data suggest that the roles differ depending on tumor type. Expression of CXCR6 and/or CXCL16 is increased in prostate cancer, with expression correlating with aggressiveness (Lu et al., 2008; Wang et al., 2008; Darash-Yahana et al., 2009; Ha et al., 2011). Similarly, expression of CXCR6 is associated with increased inflammation and poor prognosis in hepatocellular carcinoma (Gao et al., 2012). The cancer-promoting effects of CXCR6/CXCL16 have been postulated to result from direct effects on cancer cells and/or the tumorigenic activities of recruited leukocytes and/or angiogenesis. On the other hand, expression of CXCL16 in tumors has been associated with improved outcomes and increased antitumor immune responses in cancers of the colon, breast, and kidney (Hojo et al., 2007; Matsumura et al., 2008; Gutwein et al., 2009). Both the proinflammatory activity of CXCR6/CXCL16 and the activity of CXCL16 as a scavenger receptor for oxidized low-density lipoprotein have led to interest in roles for CXCL16/CXCR6 in atherosclerosis. However, data from mouse models have suggested two apparently contradictory effects. In its activity as a scavenger receptor, CXCL16 is atheroprotective (Aslanian and Charo, 2006; Barlic et al., 2009), whereas in its activity in T-cell recruitment, CXCR6 (and presumably CXCL16, possibly in a soluble form) is proatherogenic (Galkina et al., 2007). Notwithstanding the evidence linking CXCR6 to a number of important diseases, there are no published data on the development of CXCR6 antagonists or neutralizing reagents for clinical use. CCR1 is broadly expressed on both hematopoietic and nonhematopoietic cells and binds promiscuously to the inflammatory CC chemokines CCL3 (also known as macrophage inflammatory protein-1α or MIP-1α), CCL5 (previously named reduced upon activation, normal T expressed and secreted or RANTES), CCL6, CCL9, CCL15, and CCL23 (see nonstandard names in Table 1). All CCR1 ligands also bind other chemokine receptors; thus, CCR1 lacks a selective chemokine ligand. The full-length forms of CCL6, CCL9, CCL15, and CCL23 bind with low affinity, but proteolytic modification at the N terminus during inflammatory responses in vivo may increase the affinity (Berahovich et al., 2005). Although full-length CCL4 (MIP-1β) is not a CCR1 ligand, activated human peripheral blood lymphocytes secrete an N-terminally truncated form named CCL4 3-69, which is a low-affinity CCR1 ligand, although it functions as an antagonist. This form is truncated by CD26, a membrane-bound ectopeptidase with dipeptidyl peptidase IV activity (Guan et al., 2004). CCR1 activates the classic chemokine signaling pathway through the Gi/o class of G proteins (Murphy et al., 2000), causing inhibition of adenylyl cyclase and activation of phospholipase C, protein kinase C, calcium flux, and PLA2 (Nardelli et al., 1999). However, not all CCR1 ligands appear to mediate the same functions. For example, although CCL3, CCL5, and CCL16 are all able to transduce signals through CCR1 in a human osteosarcoma line via Gi/Go, phospholipase C, and protein kinase Cδ-mediated pathways, CCL16 can also signal via p38 MAPK, and in contrast to the other two ligands does not induce calcium transients (Kim et al., 2005). The CCR1 ligands CCL3, CCL7, CCL5, and CCL15 can all inhibit adenylyl cyclase activity in cells transiently transfected with CCR1. However, only CCL15 was unable to signal via Gα14- or Gα16-coupled pathways (Tian et al., 2004). CCR1 is expressed on monocytes, memory T cells, basophils, and dendritic cells (Murphy et al., 2000). It is also constitutively expressed on murine neutrophils, whereas little to no expression is observed on unstimulated human neutrophils. With regard to nonhematopoietic cells, CCR1 is expressed on lung airway smooth muscle cells; normal neurons and dystrophic neurons from patients with Alzheimer's dementia; astrocytes; endothelial cells, which suggest a possible role in angiogenesis; and in multiple myeloma cells and osteoclasts, hinting at a role in bone cancer (Horuk, 2001). CCR1 is rapidly upregulated and functional in human neutrophils treated with GM-CSF (Horuk, 2001). Conversely, CCR1 (and other CCRs) on dendritic cells and monocytes can be deactivated by LPS and other activating agents in the presence of IL-10 (D'Amico et al., 2000). In this state, the receptor may scavenge inflammatory chemokines and suppress inflammation. CCR1 can also be silenced by drugs, including statins and estrogens. Statins also reduce expression of many chemokines (CCL2, CCL3, and CCL4) and other chemokine receptors (CCR2, CCR4, and CCR5) in endothelial cells and/or macrophages stimulated with TNF-α or IFN-γ, respectively. This may explain in part their anti-inflammatory activity (Veillard et al., 2006). The mechanism may involve inhibition of geranylgeranylation. Estrogens may reduce relapses in patients with multiple sclerosis (Soldan et al., 2003), in part by inhibiting expression of CCR1 and its ligands and that of other chemokines and chemokine receptors (Matejuk et al., 2001). CCR1 has a number of nonredundant functions in host defense and inflammation (Domachowske et al., 2000; Murphy et al., 2000; Hickey et al., 2007; Liehn et al., 2008). Ccr1−/− mice are more susceptible to chronic demyelination after challenge with mouse hepatitis virus and to Aspergillus fumigatus and T. gondii (Murphy et al., 2000), but are less susceptible to granuloma formation in response to Schistosoma mansoni eggs. The precise cellular mechanisms of action are undefined. Both Ccr1 and Ccl3 appear to also be important for protection against infection with pneumonia virus of mice, a highly virulent mouse paramyxovirus (Domachowske et al., 2000). In mice lacking Ccl3 or Ccr1, virus-induced neutrophil recruitment to the airway is blunted, the eosinophil response is blocked, and mortality is markedly increased. Similar to a number of other immune proteins, CCR1 has been pirated by a virus, human cytomegalovirus, to create the receptor US28 (see below). Ccr1 also plays an important role beyond host defense and infectious disease. Ccr1−/− mice are protected from pulmonary inflammation secondary to acute pancreatitis (Murphy et al., 2000), associated with decreased TNF-α. Thus, Ccr1 may be an early player in the systemic inflammatory response syndrome. Ccr1 also appears to be involved in remodeling after myocardial ischemia (Liehn et al., 2008). Infarct size was decreased and left ventricular function was preserved in Ccr1−/− animals, associated with an altered postinfarct inflammatory cytokine pattern. A role for Ccr1 in pulmonary injury and fibrosis was recently discovered in a model of thoracic radiation using Ccr1−/− mice and the Ccr1 inhibitor BX471 (Yang et al., 2011). By contrast, mice lacking Ccr5 were not protected. CCR1 is expressed in demyelinating lesions in multiple sclerosis (Trebst et al., 2001). Consistent with a functional role, Ccl3 neutralization is completely protective in a relapsing-remitting EAE model of multiple sclerosis in mice (Karpus et al., 1995) and Ccr1−/− mice have decreased incidence and severity of disease in myelin oligodendrocyte glycoprotein-induced EAE (Rottman et al., 2000). The fact that Ccl3 neutralization is more effective than Ccr1 inactivation suggests that other Ccl3 receptors such as Ccr5 may play a role in pathogenesis and could explain in part the failure of CCR1 antagonists in clinical trials in MS. CCR1 has also been reported to mediate neutrophil recruitment to the inflamed joint in a mouse model of rheumatoid arthritis, acting in a temporal sequence with the leukotriene B4 receptor BLT1 (Chou et al., 2010; Sadik et al., 2012) (Figs. 8 and 9). To date, eight potent and selective CCR1 antagonists have been tested in human clinical trials, but results have all been disappointing (Table 3; Fig. 10). BX471 (Berlex, Richmond, CA) (Liang et al., 2000) was efficacious in preclinical models of multiple sclerosis, heart transplantation, renal fibrosis, and multiple myeloma (Pease and Horuk, 2009) but was ineffective in several phase II clinical trials, including multiple sclerosis, psoriasis, and endometriosis. MLN3897 (Millennium, Cambridge, MA) (Carson et al., 2011) inhibited CCL3-induced immune cell recruitment in a guinea pig skin sensitization model and impaired osteoclastogenesis by multiple myeloma cells (Vallet et al., 2007), but was discontinued after it failed to reach its clinical endpoint in a phase II trial for rheumatoid arthritis (Vergunst et al., 2009). The drug may have failed because of incomplete receptor coverage (Dairaghi et al., 2011; Lebre et al., 2011). CP-481,715 (Pfizer, New York, NY) (Gladue et al., 2003) was effective in models of inflammation in CCR1-humanized mice (Gladue et al., 2006) and was successful in a small phase Ib clinical trial (Gladue et al., 2006). A phase II trial in RA was stopped after 6 weeks because the compound did not demonstrate efficacy (Brown et al., 2007). Although plasma exposure was published for the phase Ib trial, where it was dosed three times a day, the formulation was changed to allow twice a day dosing in the phase II trial. As discussed in Schall and Proudfoot (2011), receptor coverage may have been insufficient; however, plasma exposure was not revealed. CCX354 (ChemoCentryx, Mountain View, CA) is an azaindazole that blocks chemotaxis of THP-1 cells induced by synovial fluid from patients with RA. CCX354 was active in two animal models (Dairaghi et al., 2011), and phase II clinical trial data showed that it reached its clinical endpoints, including a reduction in both disease score and proinflammatory markers. Merck and its subsidiary Banyu developed two clinical CCR1 antagonists, presumably xanthene carboxamides: C-6448 for multiple sclerosis and C-4462 for rheumatoid arthritis (Naya et al., 2003). No efficacy data are available from phase II clinical trials. AZD4818 (AstraZeneca) is a spirocyclic piperidine derivative (Kerstjens et al., 2010) that was effective preclinically and was entered into clinical trials for the treatment of chronic obstructive pulmonary disease (COPD) by inhalation at a dose of 300 μg twice daily for 4 weeks. Although the drug was well tolerated, it failed to meet its clinical endpoints (Kerstjens et al., 2010). CCR2 is a high-affinity receptor for members of the monocyte chemotactic protein (MCP) family, including CCL2, CCL7, and CCL13 in humans and the corresponding murine chemokines Ccl2 (also known as JE/MCP-1) and Ccl7 (Charo et al., 1994; Ben-Baruch et al., 1995; Garcia-Zepeda et al., 1996; Gong et al., 1997; Sarafi et al., 1997). CCL11 and the HIV-1 Tat protein also are CCR2 agonists (Albini et al., 1998). Human CCR2 gives rise to two alternatively spliced transcripts encoding 360 (CCR2a) and 374 (CCR2b) amino acid polypeptides that diverge only in the C-terminal cytoplasmic region (Charo et al., 1994; Wong et al., 1997). In cell transfectants, the two receptors have similar ligand profiles and functional properties (Sanders et al., 2000); however, they may be regulated differentially in vivo (Cho et al., 2007). The function of CCR2a, which is mostly found in intracellular compartments because of the presence of a retention signal located in its unique C-terminal domain (Wong et al., 1997), is presently unknown. Mouse Ccr2 has 80% amino acid identity to CCR2b and a similar expression profile (Kurihara and Bravo, 1996). CCR2 is expressed by immature dendritic cells, basophils, NK cells, and T lymphocytes, but not neutrophils or eosinophils. In mouse, Ccr2 is also expressed by the inflammatory Ly6Chigh monocyte subset (Ly6Chigh/CCR2+/CX3CR1low), which is actively recruited to inflamed tissues and gives rise to macrophages and antigen-presenting cells. Conversely, nonclassic Ly6Clow "patrolling" monocytes, which emigrate relatively poorly to inflammatory sites and have been proposed to promote tissue healing and angiogenesis, are negative for Ccr2 and instead express high levels of Cx3cr1 (Geissmann et al., 2010). Low levels of CCR2 agonists secreted under normal conditions maintain homeostatic migration of inflammatory monocytes from bone marrow into the circulation and rapidly mobilize them under inflammatory conditions. CCR2 is induced by IL-2 in T cells and NK cells (Loetscher et al., 1996b; Polentarutti et al., 1997). On the contrary, during monocyte maturation to macrophages and dendritic cells in response to IFNγ (Penton-Rol et al., 1998) and TLR agonists (Sica et al., 1997; Sallusto et al., 1998a; Arias et al., 2007), CCR2 has been reported to be downregulated, through a redox-sensitive mechanism stimulating rapid mRNA deadenylation and degradation (Xu et al., 1997; Saccani et al., 2000) and direct serine protease-dependent degradation of the receptor (Xu et al., 2000), thus allowing activated cells to leave the tissue and be recruited to draining lymph nodes (Cyster, 1999). Opposite regulation has been reported by glucocorticoids and IL-10 (Sozzani et al., 1998; Penton-Rol et al., 1999). Depending upon the cell type, CCR2 may signal through different G proteins, although in hematopoietic cells Gαi predominates supporting cell migration (Kehrl, 2006). After CCR2 triggering by CCL2 on monocyte/macrophages, the α and βγ subunits dissociate and activate a signaling cascade involving phosphatidylinositol-3-OH kinase γ, phospholipase C activation, and calcium mobilization. Ultimately, small G proteins are activated, leading to lamellipodium protrusion, cell polarization, and chemotaxis (Thelen and Stein, 2008). Through signaling mechanisms independent of G protein activation, activated CCR2 also couples to scaffold proteins, which are required for its internalization. Among others, CCR2 associates with the clathrin heavy-chain repeat homology protein FROUNT, which forms clusters at the cell front during chemotaxis (Terashima et al., 2005). Different CCR2 agonists can trigger different signaling cascades (biased agonism), suggesting that the receptor can adopt different active conformations depending upon the agonist engaged (Ogilvie et al., 2004). Similar to other GPCRs, CCR2 may also form homodimers and heterodimers with other chemokine receptors, at least when expressed in transfected cells (Sohy et al., 2009). CCR2 homodimerization occurs in the absence of the ligand, but CCL2 dimers have been shown to favor CCR2 homodimerization, which may be required for its chemotactic activity (Rodriguez-Frade et al., 1999). CCR2 heterodimerization has complex functional consequences. CCR2/CCR5 heterocomplexes have been shown to activate calcium responses via Gq/11 and to support cell adhesion rather than chemotaxis (Mellado et al., 2001). CCR2 heterodimerization may be at the basis of the synergistic effect of CCL2 with other chemokines (Gouwy et al., 2012), although in the case of CCR2/CXCR4 dimers, CXCL12 has an allosteric transinhibitory effect on CCL2 binding on CCR2 (Sohy et al., 2007). Finally, the ability of CCR2 to dimerize may significantly affect drug selectivity, because the specific antagonist of one receptor may lead to functional cross-inhibition of the other (Sohy et al., 2009). Mice lacking Ccr2 develop normally but display strong phenotypes in experimental models of disease. A pathogenetic role for Ccr2 in atherosclerosis is clearly established by evidence of sustained reduction in atherosclerostic lesions both in Ccr2-deficient and Ccl2-deficient animals challenged with a Western diet on an ApoE-deficient genetic background (Boring et al., 1998; Gu et al., 1998). Protection is associated with a reduced number of macrophages infiltrating the arterial wall, consistent with the major role of Ccr2/Ccl2 in recruitment of inflammatory Ly6Chigh/CCR2+ monocytes from the subendothelium, which expand and accumulate in lesions (Swirski et al., 2007). An additive effect with Ccr5 and Cx3cr1 has been demonstrated (Combadiere et al., 2008). Recruitment of Ly6Clow/Ccr2− cells depends only upon Ccr5 (Tacke et al., 2007). The role of Ccr2 in atherogenesis and infectious disease models (see below) may involve not only trafficking of monocytes from blood to tissue but also from bone marrow to blood, because Ccr2-deficient mice are profoundly monocytopenic (Serbina and Pamer, 2006; Jia et al., 2008). Consistent with results in experimental models, in the human setting CCL2 plasma levels after balloon angioplasty predict early restenosis (Cipollone et al., 2001), and allelic variants of CCL2 or its promoter were associated with generalized atherosclerosis and the risk of coronary artery disease (Szalai et al., 2001; McDermott et al., 2005; Brenner et al., 2006). CCR2 is also involved in stroke, as recruitment of inflammatory monocytes by postischemia induced Ccl2 results in increased infarct volume (Chen et al., 2003). As a consequence, Ccl2-deficient animals are resistant to middle brain artery occlusion (Hughes et al., 2002), and Ccr2-deficient animals are protected against ischemia-reperfusion injury (Dimitrijevic et al., 2007). Evidence from neutralizing studies and gene-targeted animals also indicate a nonredundant role of Ccr2 in the recruitment of inflammatory infiltrates into the central nervous system and in the development of EAE (Fife et al., 2000; Izikson et al., 2000). In humans, CCL2 haplotypes show a correlation with predisposition to multiple sclerosis (Ockinger et al., 2010). A nonredundant role for Ccr2 on microglia has been demonstrated in neuropathic pain models (Abbadie et al., 2003; Zhang et al., 2007). The relationship of CCR2 to Alzheimer’s disease is unclear. Analysis of CCL2 or CCR2 haplotypes and disease development risk has led to contrasting results (Conductier et al., 2010). The relevance of CCR2 in autoimmune diseases is controversial. As synovial macrophages are considered key effector cells in the pathogenesis of rheumatoid arthritis, an involvement of CCR2 was expected, but collagen-induced arthritis was accelerated and exacerbated in Ccr2-deleted animals (Quinones et al., 2005). Moreover, CCR2 targeting was not effective in patients with RA (Vergunst et al., 2008), possibly because of compensation by other chemokine receptors or suboptimal timing (Lebre et al., 2011). Similarly, animal models and genetic analysis of CCL2 and CCR2 haplotypes did not support a nonredundant role for CCR2 in other autoimmune diseases, such as systemic lupus erythematosus. CCR2 triggering induces mast cell degranulation and anti-Ccl2 can reduce eosinophil recruitment in mouse models (Gonzalo et al., 1999). However, analysis of the Ccl2/Ccr2 axis in type 2 polarized immune responses has given conflicting results. Ccl2 was shown to favor Th2 polarization (Gu et al., 2000), and Ccl2-deficient animals have been reported to have reduced airway hyperreactivity and to be resistant to allergen-induced asthma (Campbell et al., 1999a), whereas preferential development of Th2 immune responses was observed in Ccr2-deficient animals, which also had enhanced allergic responses (Kim et al., 2001c). As the reasons for this disparity are still incompletely understood, it is of relevance to note that a recent report showed that CCR2 blockade was effective in reducing bronchial hyperresponsiveness and leukocyte recruitment in a primate model of asthma (Mellado et al., 2008). CCR2 has also been shown to be required for appropriate type 1 polarized immune responses, as embolization of Ccr2-deficient mice with beads coupled to purified protein derivative resulted in smaller granulomas and reduced production of IFNγ in draining lymph nodes (Boring et al., 1997). Consistent with this, during Mycobacterium tuberculosis infection, Ccr2 is required to recruit macrophages and dendritic cells to the lung and to prime a protective adaptive immune response (Peters et al., 2001, 2004). During Listeria monocytogenes infection, Ccr2 triggering by Ccl2 and Ccl7 produced by bone marrow mesenchymal stem cells in response to TLR stimulation is required to mobilize Ccr2+/Ly6Chigh monocytes from the bone marrow and recruit them to infection sites (Serbina and Pamer, 2006; Jia et al., 2008). Similarly, after challenge with Leishmania major in the absence of Ccr2, skewing from a type 1 protective immune response to a susceptible state characterized by a type 2 polarized immune response has been reported (Sato et al., 2000). CCR2 also may play a role in AIDS pathogenesis, because CCR2 has HIV-1 coreceptor activity (Doranz et al., 1996) and the CCR2-64I allelic variant is consistently associated with delayed progression (Smith et al., 1997). Although the mechanism of action has not been defined, it is interesting to note that this receptor variant, but not the wild-type receptor, may heterodimerize with the major HIV-1 coreceptor CXCR4 (Mellado et al., 1999). CCR2+ monocytes recruited in the brain of HIV-infected patients have also been shown to sustain virus replication and HIV encephalitis (Ragin et al., 2006). As mentioned, Tat is also a direct agonist at CCR2, suggesting a second mechanism for further recruitment of target cells. A relevant role of CCR2 in tumor biology has been suggested by the direct production of CCL2 by tumor cells (Bottazzi et al., 1983), the negative prognostic value of its expression levels (Ueno et al., 2000), and its significant correlation with the number of tumor-associated macrophages, which have been associated with enhanced malignancy and poor prognosis in different human tumors (Steidl et al., 2010). After active recruitment to tumor, tumor-associated macrophages have been demonstrated to be activated by the tumor microenvironment to an alternatively activated M2 phenotype, which supports tumor growth by different mechanisms, including promotion of angiogenesis and matrix remodeling and direct tumor cell growth (Martinez et al., 2008). Recently, CCR2 has been shown to be crucial for recruitment of inflammatory monocytes at metastatic sites, but not to primary mammary tumors, where they develop as metastasis-associated macrophages and promote extravasation, seeding, and persistent growth of tumor cells in a process requiring monocyte-derived vascular endothelial growth factor. Inhibition of Ccr2 signaling blocks their recruitment, inhibits metastasis in vivo, and prolongs the survival of tumor-bearing mice (Qian et al., 2011). Inflammatory monocytes belong to a heterogeneous Gr1+ population of so-called myeloid-derived suppressor cells, which has been shown to support tumor progression via different mechanisms, including suppression of antitumor adaptive immune responses by regulatory T cells (Gabrilovich and Nagaraj, 2009). CCR2 may also be involved in chronic low-grade inflammation of adipose tissue, suggesting a role in obesity and related metabolic diseases (Kang et al., 2011). It has also been implicated in age-related macular degeneration in humans and in mouse models (Ambati et al., 2003; Combadiere et al., 2008; Raoul et al., 2010). CCR2-mediated macrophage recruitment is also required for efficient muscle regeneration in a skeletal muscle cardiotoxin-induced injury model (Martinez et al., 2010) and for alkali-induced corneal neovascularization (Lu et al., 2009). CCR2 triggering has been shown to sustain RANK (receptor activator of NF-κB) expression on preosteoclasts, and a decrease in number, size, and function of osteoclasts with consequent higher bone mass is evident in Ccr2-deficient mice, which are resistant to ovariectomy-induced bone loss (Binder et al., 2009). The role of CCR2/CCL2 in bone mass balance has recently been supported in humans by association of CCL2 GG and CCR2-64I allelic variants with osteoporosis risk (Eraltan et al., 2012). Seven CCR2 inhibitors including small molecule receptor antagonists and neutralizing antibodies to the receptor have been evaluated in clinical trials (Table 3; Fig. 11). Merck has disclosed MK-0812, a potent CCR2 antagonist (IC50 of 5.0 nM), which was their clinical candidate in phase II clinical trials for both rheumatoid arthritis and multiple sclerosis (Horuk, 2009). The CCR2 antagonist failed to show any significant improvement compared with placebo for any of the end points studied (Horuk, 2009). Incyte (Wilmington, DE) has disclosed a number of CCR2 antagonists, including INCB3284, which was one of their clinical compounds in phase II clinical studies for multiple sclerosis and lupus (Xue et al., 2011). No data from the clinical trials were ever reported. Pfizer has had an interest in CCR2 compounds, and one of its lead candidates, PF-4136309 (structure not disclosed), has been reported to be in phase II clinical trials for neuropathic pain. PF-4178903 from the same company is a dual CCR2/CCR5 antagonist with an IC50 for inhibition of CCR2 and CCR5 binding of 3.0 and 5.3 nM, respectively (Zheng et al., 2011). It was initially selected as a clinical candidate based on its potency and favorable pharmacokinetic properties, but it had major cardiovascular liabilities that precluded further clinical development (Hughes et al., 2011). Further optimization of this template resulted in PF-4254196, which had no cardiovascular liabilities and is a potent CCR2 inhibitor (IC50 for inhibition of CCR2 binding of 8.1 nM) (Hughes et al., 2011). ChemoCentryx has reported an interest in CCR2 antagonists in several patent applications (Charvat et al., 2013; Krasinski et al., 2011), and two candidate molecules have progressed to clinical trials. The development of CCX915 (structure not disclosed) was terminated because of poor pharmacokinetic properties in phase I clinical trials. Their current clinical candidate, CCX140 (structure not disclosed), is currently being evaluated in clinical trials for the treatment of type II diabetes, and favorable results from a phase II trial were recently reported (Hanefeld et al., 2011). Bristol-Myers Squibb has been very active in the CCR2 antagonist field. Two phase II clinical trials have been described for BMS-741672 (structure not disclosed). The first was a double-blind study for the treatment of neuropathic pain associated with type II diabetes, and the clinical end points were a reduction in pain score. The second trial was a 12-week randomized double-blind study for the treatment of type II diabetes, in which patients were treated with placebo or with 50 mg of CCR2 antagonist given once a day. The clinical end point was the reduction of glycated hemoglobins (a marker of diabetes). Both clinical studies ended in 2009; however, no reports have been issued. 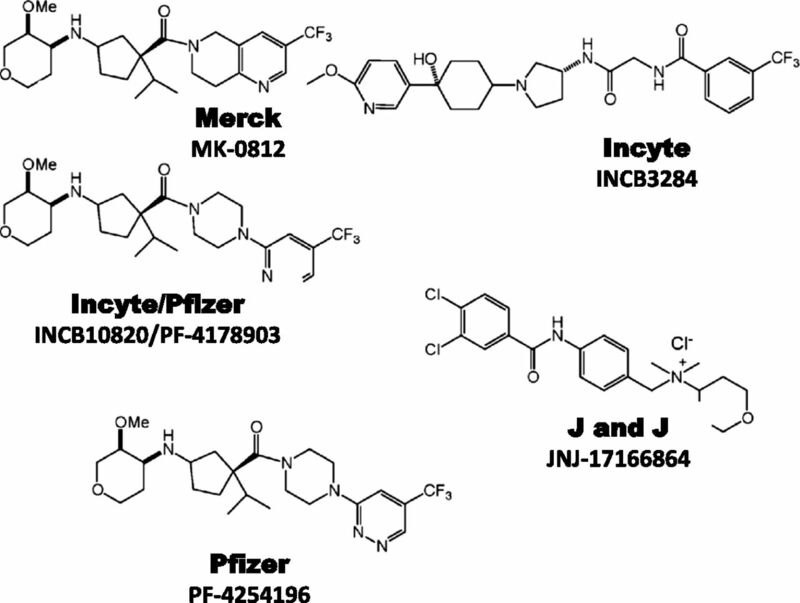 Johnson & Johnson is interested in CCR2 antagonists, and a recently described approach led to the identification of JNJ-17166864, which was highly selective for CCR2 and had a binding affinity of 20 nM (Lagu et al., 2007). The compound had a 100-fold reduced affinity for rodent CCR2 (IC50 for mouse of 2 μM) but was still able to demonstrate efficacy in two mouse models of inflammation (Lagu et al., 2007). In line with its structure as a quaternary compound, it demonstrated poor oral bioavailability, but dosing by nasal spray allowed it to enter human clinical trials for allergic rhinitis (Hou et al., 2008). No clinical data from this trial have been revealed. Millennium developed a CCR2 neutralizing antibody named MLN1202 as a therapeutic to treat autoimmune diseases such as rheumatoid arthritis. This approach has had mixed success with positive results in phase II trials for atherosclerosis (Gilbert et al., 2011) and multiple sclerosis (Sharrack et al., 2007) but negative results in a phase II trial for rheumatoid arthritis (Vergunst et al., 2008). It is noteworthy that two neutralizing monoclonal antibodies to the CCR2 ligand CCL2 have been described (Table 4). The first, ABN-912 from Millennium, failed to demonstrate efficacy in phase II clinical trials for rheumatoid arthritis (Haringman et al., 2006). The second, CNTO 888 is a nanomolar affinity antibody from Janssen Biotech (Philadelphia, PA) that is in phase II clinical trials for the treatment of cancer and idiopathic pulmonary fibrosis (Obmolova et al., 2012). Although CCR2 is the predominant receptor on circulating monocytes and this cell type is known to play a deleterious role in RA, it is probably not the right receptor to target for this indication, as discussed in Schall and Proudfoot (2011), hence the failed clinical trials. An interesting approach by Noxxon (Berlin, Germany) is NOX-E36, which is a mirror image RNA of the RNA for the chemokine CCL2. This molecule has been shown to block expression of the protein and prevent receptor engagement. Phase I clinical studies were safe, and the company is currently assessing this molecule in phase II clinical trials for the treatment of diabetic neuropathy (http://www.noxxon.com/index.php?option=com_content&view=article&id=60&Itemid=98).